Messenger RNA molecules take the information encoded in a gene's DNA sequence and turn it into instructions for building a protein. However, if certain smaller molecules of RNA—called microRNAs—bind to a messenger RNA molecule, they ‘silence’ it, which prevents the information in the messenger RNA from being translated to make a protein. Despite their small size, microRNAs are very powerful. These molecules are able to simultaneously inhibit the translation of hundreds of messenger RNAs and perform many roles, including controlling cell growth and maintaining populations of stem cells. Furthermore, microRNAs have been linked to different aspects of the growth of cancerous cells. Certain microRNAs appear to suppress tumors by regulating the growth of the stem cells found there, while others appear to be ‘hyperactive’ in cancers—including breast cancer, colon cancer, and blood cancer. In 2009, researchers compared the amount of microRNA in breast cancer stem cells that are highly capable of forming tumors with the amount in other cancer cells within the same tumor. Amongst other differences, two microRNAs (called miR-142 and miR-150) were found to be hyperactive in human breast cancer stem cells. One of them, miR-142, is known to target a gene called APC that inhibits the renewal of normal stem cells. Mutations in the APC gene have been linked to colon cancer, and scientists have suggested that the mutations inactivate APC in cancer cells to promote unregulated cell growth. Breast tumors rarely have mutations in the APC gene, but Isobe et al. wondered whether microRNAs that target this gene might also promote the growth of these tumor cells. Isobe et al.—including several of the researchers involved in the 2009 work—show that miR-142 does target the APC gene in human breast cancer stem cells, and silences it. With the gene silenced, a cancer-promoting pathway turns on and more miR-150 is made. Increasing the amount of either miR-142 or miR-150 causes excessive cell growth in breast tissue and can form abnormal breast tissue in mice. Reducing the amount of miR-142 in human breast cancer stem cells slows the growth of breast tumors. Although they only make up a small population of human breast cancer cells, focusing on breast cancer stem cells could uncover the cancer-promoting pathways that are activated in human breast cancers. MicroRNAs (miRNAs) are evolutionally conserved small non-coding RNAs that regulate the translation of mRNAs. They are recruited to an RNA-induced silencing complex (RISC) and bind to the seed sequence within the 3′ untranslated region (UTR) of target mRNAs, leading to destabilization and/or translational suppression of the target mRNAs (Bartel, 2009). The immunopurification (IP) of Argonaute (Ago), a central component of the RISC in the human and mouse, followed by microarray analyses (Ago IP/microarray method) makes it possible to isolate any Ago-associated miRNAs and mRNAs without relying on the mechanism of regulation (i.e. mRNA decay or translational suppression), or sequence conservation, enabling a comprehensive identification of the miRNA-target genes in an unbiased manner. This provides quantitative information about the mRNAs that are regulated by miRNAs (Hendrickson et al., 2008, 2009). miRNAs are able to regulate the expression of hundreds of target mRNAs simultaneously and control a variety of cell functions including cell proliferation, stem cell maintenance, and differentiation (Lewis et al., 2005). We previously identified a human breast cancer stem cell (BCSC) population (a CD44+ CD24−/low lineage− population of human breast cancer cells) that in many human breast tumors is enriched for the ability to drive tumor formation in a mouse xenograft model as compared to the remaining non-tumorigenic cancer cells (NTG cells) within the same breast tumor (Al-Hajj et al., 2003). Comprehensive analyses of the expression profile of 466 miRNAs revealed that 37 miRNAs are differentially expressed between the human BCSCs and NTG cells (Shimono et al., 2009). Among them, both miR-200c and miR-183 are downregulated in the human BCSCs and suppress the protein expression of the stem cell self-renewal gene, BMI1, and miR-200c suppresses the protein expression of the EMT regulator ZEB1 (Shimono et al., 2009; Wellner et al., 2009). Enforced expression of miR-200c can strongly suppress the tumor formation driven by human BCSCs and the mammary ducts formation by normal mammary stem cells in vivo, suggesting that miR-200c is a regulator of normal mammary and BCSCs. On the other hand, the expression of miRNAs, such as miR-142, miR-150, and miR-155, are upregulated in human BCSCs (Shimono et al., 2009). Among them, miR-155 was originally identified as a product of the oncogenic BIC gene locus in B cell lymphoma (Eis et al., 2005). Abnormal proliferation and myelodysplasia are seen when miR-155 expression is sustained in the blood system (O'Connell et al., 2008). Furthermore, miR-155 functions as an oncogenic miRNA in various cancers, including leukemia and breast cancers (Czyzyk-Krzeska and Zhang, 2013). Dysregulation of miR-142 and miR-150 are reported in leukemia, gastric and lung cancers, but their roles in breast cancer or BCSCs are not elucidated. miR-142 is involved in hematopoiesis, immune responses, and T cell differentiation (Chen and Lodish, 2005; Ramkissoon et al., 2006; Wu et al., 2007; Visone et al., 2009) and is upregulated in bronchoalveolar stem cells (Qian et al., 2008), suggesting it might have a role in the regulation of tissue stem cells. miR-142 is upregulated in human T-cell acute lymphoblastic leukemia (Lv et al., 2012) but is downregulated in acute myeloid leukemia (Wang et al., 2012). miR-150 is upregulated in adult T-cell leukemia cells (Bellon et al., 2009), gastric cancers (Wu et al., 2010), and lung cancers (Zhang et al., 2013). The canonical Wnt pathway signal is transduced by β-catenin and plays a critical role in many adult stem cells, including those of the breast and intestine (Reya and Clevers, 2005; Zeng and Nusse, 2010). The fact that some cancer cells share the extended self-renewal ability with normal stem cells, and that the canonical Wnt signaling pathway is implicated in both stem cell self-renewal and cancer suggests that normal physiological regulators of stem cell functions might be ‘hijacked’ in cancer (Reya and Clevers, 2005). A variety of putative transcriptional targets of the canonical Wnt signaling pathway, such as c-Myc and cyclin D1, are identified (He et al., 1998; Shtutman et al., 1999). Adenomatous polyposis coli (APC) is a component of the destruction complex that destabilizes β-catenin and suppresses the activity of the canonical WNT signaling pathway. In human colon cancers, mutations in the APC gene are the most commonly known acquired genetic change for the aberrant activation of the canonical WNT signaling pathway during the tumor development and progression (Kinzler et al., 1991; Nishisho et al., 1991; Cottrell et al., 1992). In a model for the stepwise progression of the colon tumorigenesis, APC gene mutations play an important role in the initiation step followed by successive mutations in other genes, including K-Ras and p53 (Fearon and Vogelstein, 1990). During clonal progression, dysregulation of downstream β-catenin targets, such as c-Myc, can relieve colon cancer cells of their dependence on β-catenin signaling (van de Wetering et al., 2002). The expression of APC is not limited to the intestine but is widely observed in many other tissues, including lung, liver, kidney, and mammary tissue. However, the role of the suppression of APC and the activation of the canonical WNT signaling in the tumor initiation process of the tissues other than the colon largely remains unknown, because APC mutations are less frequent in tumors originating from these tissues. For example, recent data from the TCGA reveals an ∼2% incidence of APC mutations in breast cancer (the TCGA Research Network: http://cancergenome.nih.gov/). Dampening of APC inhibition of β-catenin appears to be more often due to promoter methylation (36–54%) and loss of heterozygosity (LOH) (23%) than to somatically acquired APC mutations (∼2%) in human breast cancers (Sarrio et al., 2003; Jin et al., 2001; Banerji et al., 2012; The cancer genome atlas network 2012), but the presence of the APC promoter methylation and LOH are independent of tumor size or stage (Jin et al., 2001; Sarrio et al., 2003). The APC mutations in breast cancers are typically found at sites distinct from the APC mutation cluster region in colorectal cancers and are much more frequently seen in advanced than early stage breast cancers (Furuuchi et al., 2000). On the other hand, APC is targeted by the miRNAs, such as miR-27, miR-155, and miR-142 (Lu et al., 2009; Wang and Xu, 2010; Liu et al., 2011; Hu et al., 2013). These observations suggest that in addition to LOH, promoter methylation, and the APC mutations, miRNAs that target APC may regulate the aberrant activation of the canonical WNT signaling pathway for the initiation of human breast cancers, the enhancement of niche independence, and the aberrant proliferation of the human BCSCs. In this study, we studied the roles of miR-142 and miR-150, two of the miRNAs that are upregulated in the human BCSCs, in the enhancement of the canonical WNT signaling pathway and in the regulation of human BCSCs. We employed the Ago IP/microarray method to show the relevance of the targeting of APC by miR-142, but not by miR-150, and identified various target mRNAs that were efficiently recruited to RISC by these miRNAs. Upregulation of miR-142 enhanced the canonical WNT signaling pathway and transactivated the expression of miR-150. Both microRNAs had the ability to induce hyperproliferation in mammary tissue. Finally, we show that knockdown of miR-142 reduced the clonogenicity of BCSCs in vitro and tumor growth in vivo. Our results provide the insights into the roles and mechanisms of two of the upregulated miRNAs in human BCSCs. miRNAs suppress protein production by recruiting target mRNAs to the RISC where they associate with Ago, a core component of the RISC. To explore the possible target mRNAs of miR-142 and miR-150 which were more highly expressed in human BCSCs than in the NTG cells, we performed Ago IP/microarray to comprehensively identify mRNAs that were recruited to Ago by miR-142 and miR-150. Lysates from human embryonal kidney (HEK) 293T cells transfected with or without the precursor for miR-142 or miR-150 were immunopurified using an anti-Ago antibody. Amplified RNAs from the Ago-immunopurified samples were labeled and hybridized to the Human Exonic Evidence Based Oligonucleotide (HEEBO) microarrays (Klapholz-Brown et al., 2007; Hendrickson et al., 2008). We identified dozens of potential targets of miR-142 and miR-150 (Figure 1A and Figure 1A—source data 1–4). The types of miRNA seed match (i.e. the association of target mRNA with the region centered on the nucleotides 2–7 of the 5′ region of miRNAs) correlate with the efficiency of mRNA targeting by miRNAs (Bartel, 2009). The efficiency of the miR142-dependent and miR-150-dependent recruitment of specific mRNAs to the RISC complex correlated well with the types of miRNA seed matches: mRNAs with the 8mer match were most efficiently enriched, followed by those with the 7mer-m8, 7mer-1A, and 6mer sites (Figure 1B and Figure 1—figure supplement 1). Although both miR-142 and miR-150 were predicted to target the APC mRNA by a computer algorithm, the results of the Ago IP/microarray experiments showed that the APC mRNA was efficiently recruited to RISC by miR-142, and that it was hardly recruited to RISC by miR-150 (Figure 1A—source data 1–4). Among the genes associated with the activity of the WNT signaling pathway, we found that the APC mRNA was strongly recruited to Ago by miR-142 (Figure 1C). In the parallel experiments, amplified RNAs from the whole cell lysate from HEK293T cells transfected with or without the miR-142 precursor were labeled and hybridized to the HEEBO microarrays. The results showed that the abundance of the APC mRNA was consistently reduced in the miR-142-transfected HEK293T cells (Supplementary file 1). 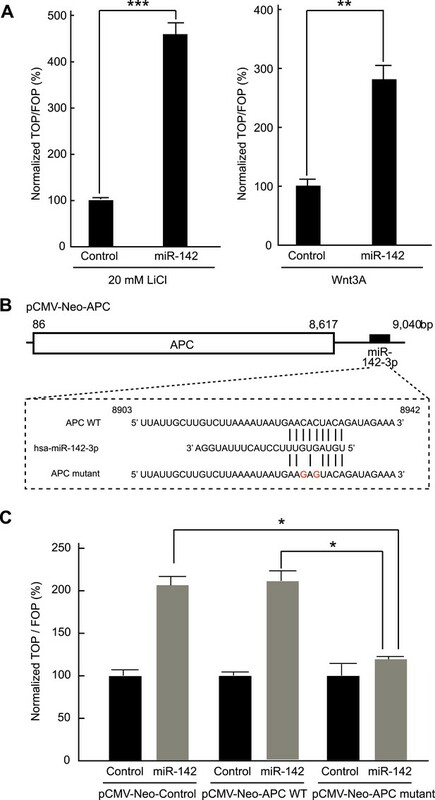 Recruitment of the APC mRNA to Ago by miR-142 or miR-150. (A) Unsupervised hierarchal cluster of AgoIP/microarray from HEK293T cells transfected with mock, miR-142- or miR-150-precursor. The lysates of HEK293T cells transfected with mock, or 30 nM miR-142- or miR-150- precursor were immunopurified by an anti-Ago antibody. RNA was isolated from the immunopurified lysate and amplified for the HEEBO microarray analyses. Rows correspond to the putative miR-142 and miR-150 targets (local false discovery rate (FDR) 1%), and columns represent individual experimental samples. (B) Cumulative distribution of the change for the Ago IP mRNAs classified by the types of the seed matches in the 3′ UTR (Bartel, 2009). Overall efficiency of Ago IP enrichment is 8mer > 7mer-m8 > 7mer-1A > 6mer-n2-7 (nucleotides 2–7) > 6mer-n3-8 (nucleotides 3–8) in the HEK293T cells transfected with miR-142 precursor. (C) Ago IP enrichment of mRNAs. The mRNA enrichment in the Ago IP samples of the miR-142-expressing HEK293T cells over those of the mock transfected cells. The results are derived from two independent transfections. The results for APC, AXIN1, and GSK3B enrichment are presented. The data are mean ± standard deviation (SD). We tested the ability of miR-142 to regulate the 3' UTR of the APC mRNA using a luciferase reporter assay. The 3′ UTR of the APC mRNA, which contained a predicted target site for miR-142-3p was cloned into the pGL3-MC vector downstream of a luciferase minigene (Figure 2A). HEK293T cells, which very weakly express miR-142, were co-transfected with the pGL3 luciferase-APC 3′UTR vector, or the control luciferase vector, pRL-TK Renilla luciferase vector, and miRNA precursors. We observed that when the 3′ UTR of the APC mRNA was included in the luciferase transcript, co-transfection of the miR-142 precursor suppressed the luciferase activity by 37% (Figure 2B). Mutations of the two nucleotides within the predicted target site for miR-142-3p in the 3′ UTR of the APC mRNA significantly weakened the ability of miR-142 to suppress the luciferase activity (Figure 2A,B), suggesting that miR-142 specifically targets the predicted seed sequence in the 3′ UTR of the APC mRNA to suppress the translation of the APC mRNA. Targeting of APC by miR-142. (A) Schematic representation of the predicted miR-142 target site within the 3′ UTR of APC. The predicted target site for miR-142-3p is located at the proximal portion of the APC 3′ UTR. Two nucleotides complementary to the seed sequence (the nucleotides 2–7 of miRNA) of miR-142-3p were mutated in the APC mutant plasmid. The number indicates the position of the nucleotides in the reference wild-type sequence of APC (NM_000038.5). (B) Activity of luciferase gene linked to the 3′ UTR of APC. The pGL3 luciferase reporter plasmids with the wild-type or mutated 3′ UTR of APC were transiently transfected into HEK293T cells along with 25 nM miR-142 precursor or negative control precursor. Co-transfected Renilla luciferase reporter was used for normalization. Luciferase activities were measured after 48 hr. The mean of the results from the cells transfected by pGL3-Control vector with control precursor was set at 100%. The data are mean ± SD (n = 3, ***p < 0.005). (C) miR-142 suppressed endogenous APC expression. miR-142-expressing HEK293T cells were cultured for 6 days, and APC protein level was analyzed by Western blotting. The intensities of the bands for APC and β-actin were measured by ImageJ software. Difference in the APC protein level between the lysate of the control precursor transfected cells and that of miR-142 transfected cells was statistically significant (n = 4, **p < 0.01). (D) Suppression of endogenous APC by miR-142 in the breast cancer cells. miR-142-expressing breast cancer MCF7 and MDA-MB-231 cells were cultured for 2 days, and the APC protein level was analyzed by Western blotting. (E) Elevation of the endogenous APC protein level by miR-142 knockdown. HEK293T cells and MDA-MB-231 cells were infected with the anti-miR-142-3p-expressing lentivirus, and GFP-positive cells were sorted by a cell-sorter. APC protein level was analyzed by Western blotting. Then we tested the ability of miR-142 to regulate expression of endogenous APC protein. Western blot analyses showed that, after 6 days, the protein level of APC was decreased in the HEK293T cells expressing miR-142 when compared to the control precursor transfected cells (Figure 2C). To confirm our findings, breast cancer cells, such as MCF7 and MDA-MB-231 cells, were transfected with the miR-142 precursor. We found that the protein level of APC was reduced in both MCF7 and MDA-MB-231 cells (Figure 2D). Next, the expression of miR-142-3p was knocked down using an anti-miR-142-3p-expressing lentivirus in the HEK293T, MDA-MB-231, and MCF7 cells which expressed miR-142 at low levels. We found that the protein level of APC was elevated in HEK293T, MDA-MB-231, and MCF7 cells transduced with the anti-miR-142-3p vector (Figure 2E and data not shown). These results suggest that miR-142 effectively targets the APC mRNA and reduces the protein level of APC in the cells including the human breast cancer cells. Inhibition of APC expression by miR-142 could, in principle, diminish the dependence of the canonical WNT signaling pathway on extrinsic WNT signals. To test this possibility, we evaluated the effects of miR-142 on the β-catenin-dependent transcription of the luciferase gene using cells transfected with a TOPFlash luciferase plasmid, which contained the β-catenin/TCF binding sites in the promoter region of a luciferase gene. As a control, cells were transfected with an otherwise identical FOPFlash plasmid, in which the β-catenin/TCF binding sites were mutated. The ratio of the measured luciferase activity of the TOPFlash plasmid to that of the FOPFlash plasmid provides a measure of the activity of the WNT/β-catenin signaling in the cells (van de Wetering et al., 1997). HEK293T cells were transfected with the miR-142 precursor and incubated with 20 mM lithium chloride (LiCl) for 6 hr to stimulate the canonical WNT signaling pathway (by inhibiting the activity of the glycogen synthase kinase 3) (van Noort et al., 2002). We found that the normalized TOPFlash/FOPFlash ratio of the luciferase activities increased by 364% in the miR-142 transfected HEK293T cells compared to that in the control precursor transfected cells (Figure 3A). In accordance with this result, the elevation of the normalized TOPFlash/FOPFlash value in the miR-142 transfected cells was observed by the stimulation with Wnt3A (Figure 3A). To further confirm that miR-142 activated the canonical WNT signaling pathway by targeting APC, we co-transfected the APC expression plasmid, pCMV-Neo-APC, that contains the complete coding sequence and the partial 3′ UTR sequence of the APC mRNA, along with the TOPFlash or FOPFlash vectors and the miRNA precursors. The miR-142-3p target site within the pCMV-Neo-APC plasmid sequence was mutated to produce the pCMV-APC mutant plasmid (Figure 3B). The co-transfection of the control plasmid, pCMV-Neo-Control, or the pCMV-Neo-APC plasmid that contains miR-142-3p targeted sequence within the 3′ UTR region, did not affect the ability of miR-142 to elevate the normalized TOPFlash/FOPFlash value. On the contrary, co-transfection of pCMV-Neo-APC mutant plasmid significantly suppressed the normalized TOPFlash/FOPFlash value to an intensity comparable to that of the control miRNA precursor transfected cells (Figure 3C). 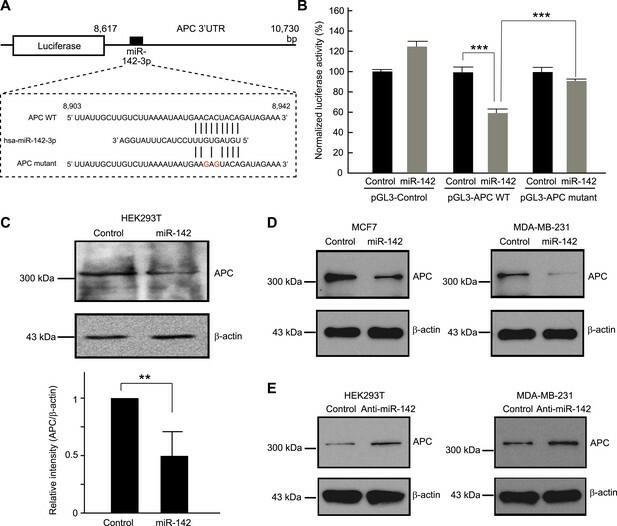 These results suggest that the activation of canonical WNT signaling pathway by miR-142 is mostly mediated by the ability of miR-142 to reduce the protein level of APC. Activation of the canonical WNT signaling pathway by miR-142. (A) Activation of the canonical WNT signaling pathway by miR-142. HEK293T cells were transfected with 25 nM miR-142 precursor along with TOPFlash or FOPFlash vector (with or without TCF binding sites). Cells were stimulated with 20 mM LiCl (left) or with Wnt3A conditioned medium (right) for 6 hr. The canonical WNT signaling pathway activities were measured by dividing a normalized TOPFlash value by a normalized FOPFlash value. The mean of the results from the cells transfected with control precursor was set at 100%. The data are mean ± SD (n = 3, **p < 0.01, ***p < 0.005). (B) Schematic representation of the pCMV-Neo-APC expression vector that codes the full-length APC sequence together with wild-type or mutated miR-142 targeted site located at the 3′ UTR. Two nucleotides complementary to the seed sequence of miR-142-3p were mutated in the pCMV-Neo-APC mutant plasmid. The number indicates the position of the nucleotides in the reference wild-type sequence of APC (NM_000038.5). (C) miR-142 targets APC to activate the canonical WNT signaling pathway. HEK293T cells were transfected with 25 nM miR-142 precursor along with the TOPFlash or FOPFlash vector and the pCMV-Neo-APC expression vector or its mutant vector. Cells were stimulated with 20 mM LiCl for 6 hr. The activities of the canonical WNT signaling pathway were measured as described in (A). The mean of the results from the cells transfected with control precursor was set at 100%. The data are mean ± SD (n = 3, *p < 0.05). The organoid culture system of the mammary tumor cells allows the in vitro formation of the organoids that maintain cellular hierarchy of the original tissue from which it derived (Sato et al., 2009; Zeng and Nusse, 2010). In this system, the tissue derived stem cells were embedded in Matrigel and cultured in the media that contained a cocktail of the growth factors, including ones that stimulate the WNT signaling pathways. We and others have previously shown that the MLTV-Wnt-1 tumor contains a CSC population (Shackleton et al., 2006; Cho et al., 2008). Because miR-142 is upregulated in the BCSCs and stimulates the canonical WNT signaling pathway that is an important regulator of the stem cell properties in mammary tissues, we tested the ability of miR-142 to regulate the organoid formation of BCSCs. The sorted murine mammary CSCs of the MLTV-Wnt-1 tumor were infected with the control lentivirus or the anti-miR-142-3p-expressing lentivirus that suppressed the expression of miR-142-3p and expressed GFP. The GFP-positive cells infected with the control lentivirus formed round-shaped organoids in 7 days (Figure 4—figure supplement 1A). In contrast, most of the cells infected with the anti-miR-142-3p-expressing lentiviruses failed to form the round-shaped organoids (Figure 4—figure supplement 1A). The number of the GFP positive organoids was significantly decreased when the mammary CSCs were infected with the anti-miR-142-3p-expressing lentivirus (Figure 4—figure supplement 1B). These results suggest that miR-142-3p is an important regulator of the organoid formation ability in murine mammary CSCs. To confirm that these findings are applicable to the human BCSCs, we infected the human breast cancer cells with the anti-miR-142-3p-expressing lentiviruses and evaluated the ability to form the organoids derived from the human BCSCs. BCSCs of the human breast cancer xenograft tumors were infected with the control lentivirus or the anti-miR-142-3p-expressing lentiviruses. The GFP positive cells infected with the control lentivirus formed round-shaped organoids in 10 days (Figure 4A). In contrast, most of the cells infected with the anti-miR-142-3p-expressing lentiviruses failed to form the round-shaped organoids (Figure 4A). The number of the GFP positive organoids was significantly decreased when the human BCSCs were infected with the anti-miR-142-3p-expressing lentivirus (Figure 4B). Then we analyzed the effects of miR-142 on the cell proliferation and apoptosis of the cancer cells in the organoids. The organoids were incubated with 5-ethynyl-2´-deoxyuridine (EdU), and the percentage of the EdU positive cells was analyzed by flow cytometry. We found that the percentage of the EdU-positive cells in the GFP-positive organoids was significantly reduced when the human BCSCs were infected with the anti-miR-142-3p-expressing lentivirus (Figure 4C). Then we analyzed the percentage of apoptotic cells in the GFP-positive organoids by flow cytometry. We found that the percentage of the annexin V-positive cells in the GFP positive organoids was significantly increased when the human BCSCs were infected with the anti-miR-142-3p-expressing lentivirus (Figure 4D). These results suggest that miR-142 critically affects the clonogenic properties of the BCSCs by regulating the proliferation and apoptosis of the breast cancer cells. Suppression of the organid formation by the inhibition of miR-142 in BCSCs. (A) Representative images of the organoids from the human BCSCs infected with control or anti-miR-142-3p-expressing lentiviruses and cultured for 10 days. The upper panels are the phase-contrast images of the organoids, and the lower panels are the fluorescent microscopic images for the detection of GFP. Bars, 100 μm. (B) The number of organoids formed by the human BCSCs infected with control or anti-miR-142-3p-expressing lentiviruses. The data are mean ± SD (n = 10, *p < 0.05). (C) Percentage of the EdU-positive cells among the GFP-positive breast cancer cells in the organoids formed by the human BCSCs infected with control or anti-miR-142-3p-expressing lentiviruses. The data are mean ± SD (n = 4, *p < 0.05). (D) Percentage of the annexin V-positive cells among the GFP-positive breast cancer cells in the organoids formed by the human BCSCs infected with control or anti-miR-142-3p-expressing lentiviruses. The data are mean ± SD (n = 4, *p < 0.05). Both miR-142 and miR-150 are more highly expressed in BCSCs relative to the non-tumorigenic breast cancer cells (Shimono et al., 2009). Because the promoter region of miR-150 contains a potential β-catenin/TCF transcription factor binding site (Figure 5A), we investigated whether miR-150 expression is regulated by the canonical WNT signaling pathway. HEK293T cells were stimulated with 20 mM LiCl for 7 hr, then crosslinked with formaldehyde, and chromatin immunoprecipitation was performed either with an antibody against β-catenin or, as a control, with mouse IgG. The anti-β-catenin antibody selectively enriched DNA fragments containing the potential β-catenin/TCF binding site within the promoter of the miR-150 precursor (Figure 5B). Then, using semi-quantitative real-time PCR, we found that the expression of miR-142 was able to upregulate the expression of miR-150 in human breast cancer MDA-MB-231 cells (Figure 5C). Moreover, inhibition of the canonical WNT signaling pathway using the siRNA against β-catenin reduced the expression of miR-150 in the miR-142-expressing MDA-MB-231 cells (Figure 5D). We further confirmed that the inhibition of miR-142 in human breast cancer organoids formed by human BCSCs infected with the anti-miR-142-3p-expressing lentiviruses decreased the expression of miR-150 (Figure 5E). Taken together, these results indicate that the upregulation of miR-142 induces the expression of miR-150 at least partially through the canonical WNT signaling pathway. Enhancement of miR-150 transcription by the canonical WNT signaling pathway. (A) Schematic representation of the potential β-catenin/TCF binding site within the flanking genomic sequence of the miR-150 precursor. Box: potential β-catenin/TCF binding site (WWCAAWG/CWTTGWW) and its sequence. Box with an arrow: position of the miR-150 precursor and direction of transcription. Black arrows: relative positions of the PCR primers for the chromatin IP analyses. (B) Chromatin IP for a potential β-catenin/TCF binding site. Lysate of cross-linked HEK293T cells was immunoprecipitated by an anti-β-catenin antibody or mouse IgG. A putative β-catenin/TCF binding site was amplified by PCR. The template for input was purified from the 1% of total cell lysate. The β-catenin/TCF binding site for c-MYC was amplified as a positive control, and the genomic sequence for β-actin was amplified as a negative control. (C) miR-142 induced the transcription of miR-150. The amount of miR-150 in the MDA-MB-231 cells transfected with a miR-142-expressing plasmid was analyzed by quantitative real-time PCR. Each circle represents one experiment. Bars indicate median. Differences of the amount of miR-150 between the miR-142-expressing and the control MDA-MB-231 cells were statistically significant (*p < 0.05). (D) Decrease of the miR-150 transcription by β-catenin knockdown. 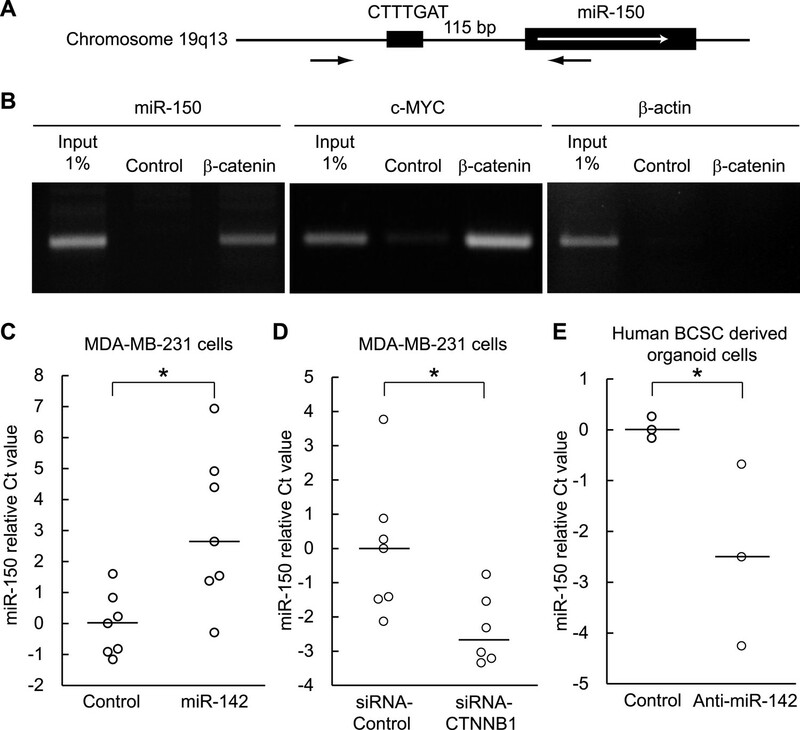 β-catenin was knocked down by the siRNA against CTNNB1 in MDA-MB-231 cells expressing miR-142. Each circle represents one experiment. Bars indicate median. The amount of miR-150 was analyzed by quantitative real-time PCR. Difference in the amount of miR-150 between the cells transfected with a siRNA against CTNNB1 and those transfected with a control siRNA was statistically significant (*p < 0.05). (E) Decrease of miR-150 expression by the miR-142 inhibition in human BCSCs. The human BCSCs derived from the human breast cancer xenograft were infected with the anti-miR-142-expressing or control letiviruses and incubated in an organoid culture medium for 48 hr. The amount of miR-150 was analyzed by quantitative real-time PCR. Each circle represents one experiment. Bars indicate median (*p < 0.05). To clarify the effect of the upregulation of miR-142 and miR-150 on the mammary tissue in vivo, murine mammary epithelial cells were transduced with the lentiviruses expressing miR-142 or miR-150 and the regenerated mammary tissues were histologically analyzed. Expression of miR-142 or miR-150 in the lentivirus infected cells was confirmed by real-time PCR (data not shown). We infected 5 × 104 lineage− murine mammary epithelial cells with the miR-142 or miR-150-expressing lentivirus and transplanted them into the cleared mammary fat pads of syngeneic mice. Non-infected and control lentivirus infected mammary cells were used as controls. Whole mount mammary tissue analyses and histological analyses were performed 8 weeks after transplantation. Transduction of the lentivirus into the mammary transplants was confirmed by the expression of ZsGreen. Overall, 7 out of 12 transplants with non-infected mammary cells and 7 out of 12 transplants with mammary cells infected with control lentivirus formed a mammary tree, suggesting that lentivirus infection was highly efficient and, by itself, did not perturb engraftment of mammary cells. Whole-mount staining and histological analysis of mammary fat pads injected with the control lentivirus-infected mammary cells showed the outgrowth of a normal-looking mammary tree structure consisting of single layers of myoepithelial and luminal cells (Figure 6A,B). In contrast, mammary cells infected with the miR-142 lentivirus formed disorganized structures with multiple layers of cells (Figure 6A,B). Histological analysis revealed that miR-142-expressing mammary cells formed clusters of cells with an abnormal appearance in which the normal mammary structure was disrupted because of the aberrant cell proliferation (Figure 6B). Mammary cells infected with the miR-150-expressing lentivirus formed a hyperplastic mammary tree with extremely increased branching and thick mammary ducts (Figure 6A,C). Histological analysis of the mammary trees showed that miR-150-expressing mammary cells formed thick hyperplastic ducts with multiple layers of mammary cells, with scattered small cavities among mammary cell layers (Figure 6B,C). But unlike miR-142-expressing mammary cells, miR-150-expressing mammary cells had a normal cellular appearance. To confirm that both the dysplastic mammary tissue formed by the miR-142-expressing mammary cells and the hyperplastic mammary tissue formed by the miR-150-expressing mammary cells were both hyperproliferative, we immunostained these tissues with an anti-PCNA antibody. We found that the epithelial cells in the miR-142-expressing and miR-150-expressing mammary tissues were positively stained with an anti-PCNA antibody (Figure 6D). In contrast, the mammary tissue regenerated by the control lentivirus transfected mammary cells was rarely stained with an anti-PCNA antibody. The results indicate that the enforced expression of either miR-142 or miR-150 induces hyperproliferation in the mammary tissues and that the phenotype of the miR-142-expressing mammary tissue is more severe and accompanied with abnormal morphology. Mammary dysplasia or hyperplasia formed by the mammary cells expressing miR-142 or miR-150 in vivo. (A) The whole-mount mammary fat pad staining. Murine mammary cells isolated from FVB/NJ mice were infected with the control lentivirus, or miR-142 or miR-150-expressing lentiviruses. The 5 × 104 infected mammary cells were transplanted into cleared mammary fat pads of the same strain weaning age female mice. Mammary duct outgrowth was analyzed 8 weeks later. The whole-mount mammary tissue was stained by a carmine alum staining solution. (B) Hematoxylin and Eosin staining of the mammary tissue formed by mammary cells infected with miR-142 or miR-150-expressing lentiviruses. Mammary duct outgrowth was analyzed 8 weeks after transplantation. (C) Degree of branching and number of mammary epithelial cell layers in the mammary tissue formed by mammary cells infected with miR-150. Degree of branching was analyzed by counting the number of branches observed within a 50× field of the whole-mount mammary fat pad specimens. Number of mammary epithelial cell layers of the ducts was counted in the hematoxylin and eosin stained specimens (**p < 0.01, ***p < 0.005). (D) Increase of the cell proliferation in the mammary tissues regenerated by the miR-142- or miR-150-expressing mammary cells. The tissues were stained with an anti-PCNA antibody followed by an Alexa Fluor 594-conjugated secondary antibody. Blue, DAPI; red, PCNA. Next, we analyzed the expression and localization of β-catenin in the regenerated mammary tissues. While the signal for the β-catenin in mammary tissue formed by the control lentivirus-infected mammary cells was weakly detectable and its localization was mostly membranous, we observed cytoplasmic and nuclear localization of β-catenin and the positive staining of active β-catenin in the dysplastic cell clusters formed by the mammary cells infected with the miR-142-expressing lentivirus (Figure 6—figure supplement 1). Although the immunohistochemistry of β-catenin in general suffers from non-specific staining, we detected nuclear β-catenin in the miR-142-expressing mammary tissue. We speculate that nuclear β-catenin was detectable in these immunohistochemistry experiments because the WNT signaling pathway was highly overstimulated in the miR-142-expressing mammary tissue. These results suggest that miR-142 regulates the properties of mammary cells by activating the WNT signaling pathway and conferring the aberrant proliferative ability. To evaluate the role of miR-142 in the growth of human breast cancers initiated by the human BCSCs, we infected human BCSCs isolated from a patient-derived human breast cancer xenograft (PDX) with the anti-miR-142-3p-expressing lentivirus or the control lentivirus. Then, 1 × 104 of the infected BCSCs were injected into the mammary fat pad region of the NSG mice. The flow cytometric analyses revealed that 94% and 96% of the human BCSCs were infected with the control or the anti-miR-142-3p-expressing lentivirus, respectively, 2 days after the infection (data not shown). The growth of the human breast cancer xenografts formed by the anti-miR-142-3p-expressing BCSCs was significantly slower than that of the control human breast cancer xenografts (Figure 7A). We further confirmed that consistent with the results of the human breast cancer cell lines (Figure 2), the protein level of APC was elevated in the human breast cancer cells isolated from the anti-miR-142-3p-expressing breast cancer xenograft (Figure 7B). These results suggest that the inhibition of miR-142-3p in human BCSCs from this patient elevated the expression of APC protein and suppressed the proliferation of the breast cancer cells in vivo. Suppression of the Tumor Growth Initiated by Human BCSCs Expressing the Anti-miR-142-3p in vivo. (A) CD44+ CD24-/low lineage− human BCSCs were isolated from an early passage human breast xenograft tumor and infected by the anti-miR-142-3p-expressing lentivirus or control lentivirus. Ten thousand infected cells were injected into the mammary fat pad region of immunodeficient NSG mice. Tumor growth was monitored for 2 months after injection. The data are mean ± SD (n = 10, * *p < 0.01, ***p < 0.005). (B) APC expression in the xenograft tumors was derived from the control or anti-miR-142-3p-expressing lentivirus infected BCSCs. Tumors were dissociated and APC expression was analyzed by western blotting. Our results demonstrate that APC is indeed a relevant target of miR-142. In both normal and malignant mammary cells, miR-142 activates the canonical WNT signaling pathway and regulates proliferation at least in part through upregulation of the WNT/β-catenin signaling. However, because each miRNA can have hundreds of targets in general, it is likely that other pathways also have roles in the regulation of normal and malignant breast epithelium by miR-142. Expression of APC protein is modulated by miRNAs, such as miR-135, miR-27, miR-155, and miR-142 (Nagel et al., 2008; Lu et al., 2009; Wang and Xu, 2010; Hu et al., 2013). Elevated expression of miR-135, which targets the APC mRNA, has been observed in colorectal adenomas and adenocarcinomas with/without biallelic APC mutations, suggesting that this miRNA could play a primary or synergistic role in activation of the canonical WNT signaling pathway during colon cancer development (Nagel et al., 2008). In a model of osteoblast differentiation, miR-27 and miR-142 were shown to regulate APC expression and to positively modulate the canonical WNT signaling pathway (Wang and Xu, 2010; Hu et al., 2013). miR-155 targets APC and inhibition of miR-155 using the anti-miR-155 increases the protein level of APC (Lu et al., 2009). It is noteworthy that both miR-142-3p and miR-155 are more highly expressed in the human BCSCs than in the NTG cells (Shimono et al., 2009). In this study, we show that miR-142 reduced the protein level of APC and enhanced the canonical WNT signaling pathway in normal and malignant mammary epithelium. This is important for the stem cells in the mammary gland (Haegebarth and Clevers, 2009; Zeng and Nusse, 2010). The dysregulated WNT signaling can enhance niche independence and promote aberrant proliferation of stem cells. Taken together, upregulation of miR-142, miR-150, and miR-155 may not only be hallmarks of BCSCs but could actually contribute directly to aberrant proliferation of these cells. In this report, we show that miR-150 is a target of miR-142 via its regulation of the canonical WNT/β-catenin signaling. Notably, miR-150 plays a role in the proliferation induced by miR-142 and the canonical WNT/β-catenin signaling. Our results suggest that miR-150's regulation of proliferation is downstream of the canonical WNT/β-catenin signaling. In addition, the APC mRNA has a predicted target site for miR-150. We constructed the pGL3 luciferase expression plasmid in which the miR-150 target site within the 3′ UTR of the APC mRNA was cloned downstream of a luciferase minigene and found that the activity of this luciferase plasmid was reduced by 32% when the miR-150 precursor was co-transfected (data not shown). However, the results of the Ago IP/microarray experiments revealed that APC mRNA was much less efficiently recruited to RISC by miR-150 (Figure 1A—source data 3–4). Because each miRNA has multiple target genes, we speculate that the presence of many other target genes with higher affinity to the miR-150-containing RISC will perturb the ability of miR-150 to regulate the APC mRNA and that miR-150 has much weaker effect, if any, on the WNT signaling pathway in vivo. Some miRNAs are known to be regulated by transcriptional factors which have critical roles in regulating development, proliferation, and cell survival (Bracken et al., 2008; O'Donnell et al., 2005; Raver-Shapira et al., 2007; Yamakuchi et al., 2010; Chang et al., 2007; Ma et al., 2007). For example, the transcriptional repressors, ZEB1 and ZEB2, which can play a positive role in EMT, suppress transcription of the miR-200a-miR-200b-miR-429 cluster, which in turn represses expression of ZEB1 and ZEB2, thereby forming a double negative feedback loop (Bracken et al., 2008). c-Myc enhances expression of the miR-17-92 cluster, which in turn represses E2F1 expression and thereby suppresses cell-cycle entry (O'Donnell et al., 2005). The tumor suppressor Tp53 regulates expression of miRNAs, including miR-34a, miR-107, and miR-200 (Chang et al., 2007; Raver-Shapira et al., 2007; Yamakuchi et al., 2010; Chang et al., 2011). Expression of miR-10b, a miRNA that promotes breast cancer cell metastasis by inhibiting HoxD10, is regulated by the transcription factor Twist, a major regulator of the epithelial-to-mesenchymal transition (Ma et al., 2007). We identified a TCF/β-catenin binding site in the promoter region of miR-150 and showed that miR-142 stimulates the canonical WNT signaling pathway in vivo and elevates the expression of miR-150. It has recently been reported that miR-150 induces proliferation and suppresses apoptosis of breast cancer cells (Huang et al., 2013). A simple model to explain the upregulation of miR-142 and miR-150 in human BCSCs is that suppression of the APC protein expression by miR-142 increases the activity of the canonical WNT signaling pathway and thereby enhances the miR-150 expression. We note that our results show that miR-142 upregulates the expression of miR-150 when miR-142 is highly expressed and/or the WNT signaling pathway is strongly stimulated in mammary epithelial cells. Considering that miR-142 is highly expressed in human BCSCs but weakly expressed or undetectable in the stem/progenitor population of the mammary epithelial cells, our result suggests that the upregulation of miR-142 and the increase of the miR-150 expression by miR-142 could be especially relevant in the initiation and/or progression of human breast cancers driven by human BCSCs in vivo. The results of the mouse models suggest that APC dysregulation is associated with initiation and progression of at least some breast cancers. Mice heterozygous for a germline mutation in Apc (Apc+/850T, ApcMin mice) spontaneously develop mammary tumors, although at significantly lower frequency than intestinal tumors (Moser et al., 1993). Mice heterozygous for a C-terminal truncation mutation, Apc+/1572T, develop multifocal mammary tumors with pulmonary metastasis at much higher frequency (Gaspar et al., 2009). MMTV-promoter-Wnt1 transgenic mice develop breast tumors composed of both luminal and myoepithelial component and expanded mammary stem cell pools (Cho et al., 2008). Finally, heterozygous mutation of APC in immature, but not mature, mammary epithelium induces breast tumors (Kuraguchi et al., 2009). These results suggest that activation of the canonical WNT signaling pathway in mammary epithelium, by mutation of APC, excessive ectopic WNT expression, and/or stabilization of β-catenin contribute to mammary tumor initiation in the same way as colon cancer at least in mouse models of the mammary tumors. However, although these mouse models that upregulate the canonical WNT signaling activity induce mammary gland tumors (Moser et al., 1993; Gaspar et al., 2009; Kuraguchi et al., 2009), APC mutations are less frequently found in human breast cancers (Furuuchi et al., 2000; Jin et al., 2001; Sarrio et al., 2003). APC is a key tumor suppressor that regulates the canonical WNT signaling pathway and is involved in development and homeostasis of a variety of cells including stem cells (Reya and Clevers, 2005). In addition, APC has additional important cellular functions, including roles in cell adhesion, migration, organization of actin and microtubule networks, spindle formation, and chromosome segregation (Aoki and Taketo, 2007). Thus, dysregulation of these processes by mutations in the APC gene is frequently implicated in tumor initiation and progression. Our results show that upregulation of miR-142 can significantly enhance the canonical WNT signaling pathway through the suppression of APC including in the mammary cells. Therefore, miR-142, a miRNA frequently upregulated in human BCSCs than in the NTG cells (Shimono et al., 2009), could provide at least a part of the shared molecular mechanism for aberrant activation of the canonical WNT signaling pathway in BCSCs and for the initiation and progression of breast cancers. Primary breast cancer specimens and normal breast tissues were obtained from the consented patients as approved by the Research Ethics Boards at Stanford University and at the City of Hope Cancer Center in California. All animal experiments were carried out under the approval of the Administrative Panel on Laboratory Animal Care of Stanford University. Human embryonic kidney (HEK) 293T cells, and MCF7, and MDA-MB-231 breast carcinoma cells were maintained in Dulbecco's modified Eagle's medium (DMEM) with 10% FBS, 100 U/ml penicillin, 100 μg/ml streptomycin with or without 250 ng/ml amphotericin B (Invitrogen, Carlsbad, CA) and incubated at 5% CO2 at 37°C. HEK293T cells were seeded at 6 × 106 cells in 10-cm tissue culture plates 12 hr prior to transfection. All transfections were carried out with Lipofectamine 2000 (Invitrogen), according to the manufacturer's instructions. A set of four plates was transfected with same miRNA precursors and each plate was transfected with 300 pmol miRNA precursor (Ambion, Austin, TX). Plates were washed with 1× ice-cold phosphate-buffered saline (PBS) at 48 hr post-transfection and 700 µl of an ice-cold lysis buffer (150 mM KCl, 25 mM Tris–HCl, pH 7.4, 5 mM EDTA, 0.5% Nonidet P-40, 0.5 mM DTT, 100 U/ml SUPERase In (Ambion) with Complete proteinase inhibitor (Roche, Germany)) was added to a 10-cm plate. After incubating for 30 min at 4°C, plates were scraped and the lysates were combined and spun at 14,000 rpm at 4°C for 30 min. The supernatant was collected and filtered through a 0.45 µm syringe filter. The biotinylated anti-Argonaute antibody (12.5 μg; biotin was conjugated to an anti-human Ago antibody (#01-2203, Wako, Japan)) (Hendrickson et al., 2009) was mixed with 250 μl Dynal M-280 Streptavidin coated magnetic beads (Invitrogen), which were equilibrated by washing three times with lysis buffer and twice with PBS. The beads were incubated with the lysate at 4°C for 4 hr and washed twice with 10× volume of lysis buffer for 5 min. Five percent of the beads were frozen for SDS-PAGE analysis after the second wash. RNA was extracted directly from the remaining beads with 25:24:1 phenol:chloroform:isoamyl alcohol (Invitrogen). Trace amounts of phenol were removed by chloroform extraction and RNA was precipitated using Glycogen (Invitrogen) as a carrier. RNA pellets were resuspended in 30 µl of RNase free water and stored at −80°C. Detailed methods for microarray experiments are available at the Brown lab website (http://cmgm.stanford.edu/pbrown/protocols/index.html). HEEBO oligonucleotide microarrays were produced by Stanford Functional Genomic Facility. The HEEBO microarrays contain ∼45,000 70-mer oligonucleotide probes, representing ∼30,000 unique genes. A detailed description of this probe set can be found at http://microarray.org/sfgf/heebo.do. RNA from IP experiments was hybridized to microarrays printed on epoxysilane glass (Hendrickson et al., 2009). For HEEBO microarray experiments, poly-adenylated RNAs were amplified in the presence of aminoallyl-UTP with Amino Allyl MessageAmp II aRNA kit (Ambion). For expression experiments, universal reference RNA was used as an internal standard to enable reliable comparison of relative transcript levels in multiple samples (Stratagene, La Jolla, CA). Amplified RNA (3–10 µg) was fluorescently labeled with NHS-monoester Cy5 or Cy3 (GE Healthcare, United Kingdom). Dye-labeled RNA was fragmented, then diluted in a 50 µl solution containing 3× SSC, 25 mM HEPES-NaOH, pH 7.0, 20 µg human Cot-1 DNA (Invitrogen), 20 µg poly(A) RNA (Sigma-Aldrich, St.Louis, MO), 25 μg yeast tRNA (Invitrogen), and 0.3% SDS. The sample was incubated at 70°C for 5 min, spun at 14,000 rpm for 10 min in a microcentrifuge, then hybridized at 65°C for 12–16 hr (Hendrickson et al., 2009). Following hybridization, microarrays were washed in a series of four solutions containing 400 ml of 2× SSC with 0.05% SDS, 2× SSC, 1× SSC, and 0.2× SSC, respectively. The first wash was performed at 65°C for 5 min. The subsequent washes were performed at room temperatures for 2 min each. Following the last wash, the microarrays were dried by centrifugation in a low-ozone environment (<5 ppb) to prevent the destruction of Cy dyes (Fare et al., 2003). Once dry, the microarrays were kept in a low-ozone environment during storage and scanning (see http://cmgm.stanford.edu/pbrown/protocols/index.html). Microarrays were scanned using either AxonScanner 4200 or 4000B (Molecular Devices, Sunnyvale, CA). PMT levels were auto-adjusted to achieve 0.1–0.25% pixel saturation. Each element was located and analyzed using GenePix Pro 5.0 (Molecular Devices). Data were filtered to exclude elements that did not have a regression correlation of ≥0.6 between Cy5 and Cy3 signal over the pixels compromising the array element of and intensity/background ratio of ≥2.5 in at least one channel, for 60% of the arrays. For cluster and SAM analysis of Ago+/− miRNA IPs vs mock IPs, measurements corresponding to oligonucleotides that map to the same EntrezID were treated separately and the data were globally normalized per array, such that the median log2 ratio was 0 after normalization. A 525 bp fragment of the APC 3′ UTR (corresponding to the positions of 8589–9113 of the NM_000038.5) was amplified by PCR using the cDNA of HEK293T cells as a template and cloned into the pGEM-T-Easy vector. Then the APC 3′ UTR product was cloned at the 3′ of the luciferase gene of the pGL3-MC vector (Shimono et al., 2009). All products were sequenced. The pCMV-Neo-Bam APC plasmid was obtained from Addgene (Cambridge, MA). To produce the control pCMV-Neo-Control plasmid, the pCMV-Neo-Bam-APC plasmid was digested by BamHI and ligated. Mutation of the putative miR-142-3p target sequences within the 3′ UTR of APC and within the pCMV-Neo-Bam-APC plasmid was generated using the QuikChange Site-Directed Mutagenesis kit (Stratagene). The sequences of hsa-miR-142 including stem loop structure and 200–300 base pairs of up-stream and down-stream flanking regions were cloned by PCR using genomic DNA of HEK293 cells as a template. The products were cloned into multicloning sites of pEIZ-HIV-ZsGreen vector (kind gift from Dr. Zena Werb, UCSF) (Welm et al., 2008). Lentiviruses were produced as described (Tiscornia et al., 2006). For knockdown of miR-142-3p, the miRNA Zip (anti-miRNA) plasmid specific for miR-142-3p (MZIP142-3p-PA-1) together with the scrambled control RNA-expressing plasmid was purchased from System Bioscience (Mountain View, CA) and lentiviruses were produced, according to the manufacturer's instructions. HEK293T cells were seeded at 1 × 105 cells per well in 48-well plates the day prior to transfection. All transfections were carried out with Lipofectamine 2000 (Invitrogen), according to the manufacturer's instructions. Cells were transfected with 320 ng pGL3 luciferase expression construct containing the 3′ UTR of human APC, 40 ng pGL4.74 hRLuc/TK Renilla luciferase vector (Promega, Fitchburg, WI), and 25 nM hsa-miR-142 precursor or negative control precursor (Ambion). Forty-eight hr after transfection, luciferase activities were measured using the Dual-Luciferase Reporter Assay System (Promega) and normalized to Renilla luciferase activity. For the TOPFlash/FOPFlash Reporter assays, cells were transfected with 320 ng TOPFlash or FOPFlash luciferase expression construct containing TCF/β-catenin binding sites, 40 ng pRL-TK Renilla luciferase vector (Promega), and 25 nM hsa-miR-142 precursor or negative control precursor (Ambion). To co-transfect pCMV-Neo-APC plasmids, cells were transfected with 200 ng TOPFlash or FOPFlash luciferase expression construct, 20 ng pRL-TK Renilla luciferase vector (Promega), 300 ng pCMV-Neo-APC plasmids, and 25 nM hsa-miR-142 precursor or negative control precursor (Ambion). 48 h after transfection, cells were stimulated by 20 mM LiCl or 15% Wnt3A conditioned medium for 6 hr. Luciferase activities were measured using the Dual-Luciferase Reporter Assay System (Promega) and normalized to Renilla luciferase activity. All experiments were performed in triplicate. The cells were seeded at 7 × 105 cells in a 6-well plate, transfected with miR-142-precursor, and cultured for 2 days. To analyze the effect of anti-miR-142-3p in breast cancer cells and human breast cancer xenograft cells, the cells were infected with the anti-miR-142-3p-expressing lentivirus and the GFP-expressing cells were collected using a cell sorter. Cells were washed with PBS twice and soaked in hypotonic buffer (10 mM Tris–HCl pH 7.5, 5 mM MgCl2) with Complete proteinase inhibitor (Roche) on ice for 20 min and sonicated. Then an SDS sample buffer (50 mM Tris–HCl, pH 6.8, 2% SDS, 10% glycerol 5 mM EDTA, 0.02% bromophenol blue, 3% β-mercaptoethanol) was added to the total cell lysate. Samples were separated on SDS-4-15% gradient polyacrylamide gel electrophoresis and transferred to polyvinylidene difluoride filters (Amersham). After blocking with 5% skim milk in 0.05% Tween 20/PBS, filters were incubated with 1:100 diluted anti-APC polyclonal antibody (C-20, sc-896, Santa Cruz Biotechnology, Dallas, TX) or 1:500 diluted anti-β-actin monoclonal antibody (C4, sc-47778, Santa Cruz Biotechnology). Then 1:5000-10,000 diluted peroxidase-conjugated sheep anti-rabbit or mouse IgG antibody (Amersham, United Kingdom) was added and developed using the SuperSignal West Dura Substrate (Thermo Scientific, Waltham, MA). The experiments were repeated four times and the intensity of the band was measured using the ImageJ software. Mouse MMTV-Wnt1 breast tumors were digested and CD45-Thy1+CD24+ murine breast cancer cells were isolated using a cell sorter as described previously (Cho et al., 2008). Three thousand CD45-Thy1+CD24+ murine breast cancer cells were sorted directly into 150 μl of the organoid medium (Advanced DMEM/F12 medium (Invitrogen) supplemented with 2 mM GlutaMax (Invitrogen), 10 mM HEPES (Sigma-Aldrich), 1 mM sodium pyruvate (Lonza, Switzerland), 10% FBS, 500 ng/ml R-spondin1 (R&D systems, Minneapolis, MN), 100 ng/ml Noggin (Peprotech, Rocky Hill, NJ), ITES media supplement (Lonza), 50 ng/ml EGF (Peprotech), 10 μM Y-27632 (Calbiochem, Gibbstown, NJ), 100 U/ml penicillin, 100 μg/ml streptomycin, 250 ng/ml amphotericin B (Invitrogen)). The cells were infected with 25 multiplicity of infection (moi) of control or anti-miR-142-3p-expressing lentiviruses and cultured in the ultra-low attachment 96-well plate for 12 hr. To prepare a feeder layer, 2 × 103 irradiated 3T3-L1 cells (Sigma-Aldrich) were seeded in a 96-well plate and cultured with a feeder medium (Advanced DMEM/F12 medium supplemented with 2 mM GlutaMax, 10 mM HEPES, 1 mM sodium pyruvate, 10% FBS, 100 U/ml penicillin, 100 μg/ml streptomycin, and 250 ng/ml amphotericin B (Invitrogen)) at 5% CO2 at 37°C for 16 hr. Then feeder media were replaced by 40 μl of growth factor reduced Matrigel (BD Bioscience, Franklin Lakes, NJ). Three thousand lentivirus-infected MMTV-Wnt1 tumor cells in 150 μl of the organoid media were plated on the Matrigel and cultured at 5% CO2 at 37°C. The CD44+ CD24−/low human BCSCs were collected from the dissociated single cell suspension of the early-passaged human breast xenograft (COH69). The cells were infected with 20 moi of control or anti-miR-142-3p-expressing lentiviruses and cultured in the ultra-low attachment 96-well plate for 12 hr. To prepare a feeder layer, 1 × 104 irradiated L Wnt-3A cells (ATCC, Manassas, VA) were seeded in a 96-well plate and cultured with a feeder medium at 5% CO2 at 37°C for 16 hr. Then feeder media were replaced by 50 μl of growth factor reduced Matrigel (BD Bioscience). Five thousand lentivirus-infected human BCSCs in 100 μl of the organoid media were plated on the Matrigel and cultured at 5% CO2 at 37°C. The organoids were observed using a microscope (Leica DMI 6000 B, Leica, Germany).The organoid cells were incubated with 10 μM EdU for 2 hr and the proliferation of the dissociated organoid cells was analyzed using the Click-iT Plus EdU Alexa Flour 647 Flow Cytometry Assay Kit (Life Technologies, Carlsbad, CA), according to the manufacturer's instructions. The flow cytometric analyses of apoptotic cells in the organoids were performed using an APC-conjugated Annexin V (BioLegend, San Diego, CA). Chromatin IP was performed using the Magna ChIP G kit (Upstate, Lake Placid, NY), according to the manufacturer's protocol. HEK293T cells were seeded at 2 × 107 cells in 15-cm tissue culture plates and cells were treated with 20 mM LiCl for 7 hr. Cells were crosslinked by adding formaldehyde directly to culture medium to a final concentration of 1% and incubated for 10 min, followed by incubation with glycine for 5 min. After washing twice with ice-cold PBS, cells were scraped and collected in a microcentrifuge tube. Cell were precipitated by spinning at 3000 rpm at 4°C for 5 min and incubated with the lysis buffer with proteinase inhibitor on ice for 15 min. Tubes were spun, the nuclear lysis buffer with proteinase inhibitor was added and sonicated to form shared chromatin of about 200–1000 base pairs in length (data not shown). The product was diluted 10 times by ChIP dilution buffer, and 2 μg of an anti-β-catenin antibody (clone 14, BD Bioscience) or control normal mouse IgG (Santa Cruz Biotechnology) together with 20 μl of fully suspended protein G magnetic beads were added. Lysates were incubated overnight with rotation at 4°C and washed with low salt buffer, high salt buffer, LiCl buffer, and TE buffer. DNA was purified by using the column provided in the kit. The primer set was designed for the human genomic sequence flanking the putative TCF/β-catenin binding site (Figure 5A). The sequences of primers are: miR-150 forward, GTGTGCAGTTTCTGCGACTCAG; reverse, CACTGGTACAAGGGTTGGGAGAC; c-MYC forward, GCACGGAAGTAATACTCCTCTCCTC; reverse, CAGAAGAGACAAATCCCCTTTGCGC; β-actin forward, GTGTCTAAGACAGTGTTGTGGGTGTAG; reverse, CTGGGGTGTTGAAGGTCTCAAACATG. The amount of TCF/β-catenin biding sequence enriched by chromatin IP was evaluated by PCR and subsequent agarose gel electrophoresis. RT, pre-PCR, and the real-time PCR for miRNA expression analyses were performed by the real-time PCR method as described previously (Tang et al., 2006; Shimono et al., 2009). The abundance of each miRNA was measured individually by using the 7900HT Fast Real-Time PCR System (Applied Biosystems, Foster City, CA). Results were normalized by the amount of small nuclear RNA expression, C/D box 96A, C/D box84, or U6 snRNA. Cells were transfected with miR-142-precursor and cultured for 2 days. To analyze the effect of anti-miR-142-3p in human breast cancer xenograft cells, the cells were infected with the anti-miR-142-3p-expressing lentivirus and the GFP-expressing cells were collected using a cell sorter. To knockdown β-catenin, the cells were transfected with siRNA against CTNNB1 (Life Technologies) or negative control siRNA (Life Technologies) using the Lipofectamine RNAiMAX reagent (Life Technologies). The cells were lysed with TRIzol (Life Technologies), and total RNAs were extracted following the manufacture's protocol. SuperScript VILO (Life Technologies) and TaqMan MicroRNA Reverse Transcription kit (Life Technologiies) were used for the mRNA and miRNA measurement experiments, respectively. Then, RT products were amplified with TaqMan PreAmp master Mix (Life Technologies), when necessary. The abundance of each mRNA or miRNA was measured using a 7900HT Fast Real-Time PCR system (Applied Biosystems). Mammary epithelial cells were obtained as described previously (Stingl et al., 2006). Briefly, mammary glands from 8- to 14-week old virgin female FVB were digested with collagenase/hyaluronidase (StemCell Technologies, Canada). Single cell suspension was obtained by dissociation of the fragments with 0.25% trypsin, and dispase and DNase I (StemCell Technologies). Lineage− mammary epithelial cells were obtained after removing the CD45+, Ter119+, and CD31+ cells using the EasySep mouse epithelial cell enrichment kit (StemCell Technologies). The isolated cells were mixed with 5 moi of lentivirus and incubated for 16 hr at 5% CO2 at 37°C. Our flow cytometry analysis using the lentivirus-infected mammary cells revealed that ∼50% of the mammary cells were infected 1 day after infection. Fifty-thousand lentivirus infected cells were injected into cleared mammary fat pad of weaning age FVB/NJ female mouse. After 8 weeks, ZsGreen expression of the transplanted mammary tissue was checked under the fluorescent microscope (Leica DMI 6000 B). Whole-mount mammary tissue was fixed in Carnoy's fixative (60% ethanol, 30% chloroform, 10% glacial acetic acid) for 4 hr, and whole-mount staining was performed using carmine alum staining solution. For hematoxylin and eosin staining, the mammary tissue with ZsGreen expression was fixed in formalin, embedded in paraffin, and stained by hematoxylin and eosin staining method. The stained tissue was observed using a microscope (Leica DM 4000 B). Formalin-fixed paraffin-embedded tissue was cut in serial sections and mounted on glass slides. The tissue sections were deparaffinized and rehydrated. Antigen retrieval was performed using a 0.01 M citrate buffer (pH 6.0) by heating the sample in a microwave for 20 min. The slides were incubated with an anti-PCNA antibody (clone D3H8P, Cell Signaling, Danvers, MA), an anti-β-catenin antibody (1:200, clone 14, BD Bioscience), or an anti-active-β-catenin antibody (1:100, clone 8E7, Millipore, Billerica, MA) at 4°C overnight. Then tissue was stained by an Alexa Fluor594-conjugated secondary antibody (1:200, Jackson Laboratory, Bar Harbor, ME) or an Alexa Fluor 488-conjugated secondary antibody (1:200, Invitrogen) at room temperature for 1 hr. The stained tissue was observed using a fluorescent microscope (Leica DM 4000 B). The CD44+ CD24-/low lineage− human BCSCs were isolated by a cell sorter. BCSCs were infected by 20 moi of anti-miR-142-3p-expressing lentivirus or control lentivirus by spin infection for 2 hr. Infected cells were washed with PBS and were mixed with Matrigel (BD Biosciences). Ten thousand infected cells were injected into mammary fat pad of female NSG mouse. Tumors were measured twice a week, and their volume was estimated using the formula: volume = ab2/2 (a, length; b, width) (Tanaka et al., 1990). All experiments were carried out under the approval of the Administrative Panel on Laboratory Animal Care of Stanford University. Data from experiments were statically analyzed using T-test. For the results of real-time PCR, we employed Mann–Whitney U-test. Proceedings of the National Academy of Sciences of USA 100:3983–3988. Journal of Cell Science 120:3327–3335. Proceedings of the National Academy of Sciences of USA 102:3627–3632. The American Journal of Pathology 156:1997–2005. The American Journal of Pathology 174:715–721. British Journal of Cancer 85:69–73. Biochemical and Biophysical Research Communications 408:259–264. Proceedings of the National Academy of Sciences of USA 90:8977–8981. The Journal of Experimental Medicine 205:585–594. Biochemical and Biophysical Research Communications 377:668–673. International Journal of cancer. Journal International Du Cancer 106:208–215. Proceedings of the National Academy of Sciences of USA 96:5522–5527. The Journal of Biological Chemistry 277:17901–17905. Biochemical and Biophysical Research Communications 402:186–189. Biochemical and Biophysical Research Communications 392:340–345. Proceedings of the National Academy of Sciences of USA 107:6334–6339. Thank you for sending your work entitled “miR-142 regulates the tumorigenicity of human breast cancer stem cells through the canonical WNT signaling pathway” for consideration at eLife. Your article has been evaluated by a Senior editor and 4 reviewers, one of whom is a member of our Board of Reviewing Editors. The Reviewing editor and the other reviewers discussed their comments before we reached this decision, and the Reviewing editor has assembled the following comments that we wish you to consider in deciding how to proceed. All four reviewers find your model interesting and the work of potential interest to the broad readership of eLife. While reviewers 2 and 3 point out that there are studies on miR-150 that have previously linked it to APC and breast cancer tumor growth, your study investigating the functional role of two up-regulated miRNAs, miR-142 and miR-150, in breast cancer development, is intriguing and would represent a significant advance if substantiated further. Indeed the novelty rests upon showing that miR-142 over-expression regulates miR-150 expression, while miR-150 over-expression enhances canonical WNT signaling, and that this is physiologically relevant to tumor progression in vivo. The manuscript does provide interesting insights into the roles and mechanisms of miRNAs in the mammary gland. The major concern is that despite the attractiveness of your model, the major conclusions are not yet substantiated with sufficient evidence to make a compelling case. Several relatively straightforward experiments could be performed that if successful would strengthen the work and make it more appropriate for eLife. 1) Reviewer 2's suggestions for testing your model more rigorously seems reasonable, namely 1) to knockdown miR-142 in breast cancer cells (which you've already done) or mammary epithelial cells and perform qPCR for APC and miR-150. The prediction would be APC upregulation and miR-150 down-regulation. And 2) to inhibit WNT signaling in breast cancer cells or mammary epithelial cells and test whether this leads to reduced miR-150 expression. 2) Both reviewers 1 and 2 were troubled by the apparent discrepancy between the in vivo and in vitro data. Based on the model, miR-142 over-expression or inhibition should phenocopy miR-150 over-expression or inhibition. However, this doesn't seem to be the case as during mammary gland regeneration in vivo, miR-142 and miR-150 have opposite effects: one inhibits regeneration while the other promotes it even though in both cases, beta-catenin is stabilized and activated. It would be essential to reconcile this in vivo observation with the proposed mechanism derived from your in vitro study that both sit in the same pathway with miR-142 activating Wnt and miR-150 suppressing APC. 3) In regards to point 2 above, reviewers 1 and 3 point out that there is no demonstration that the breast cells overexpressing miR-142 eventually develop tumours or are more prone to getting tumours compared to wildtype cells. 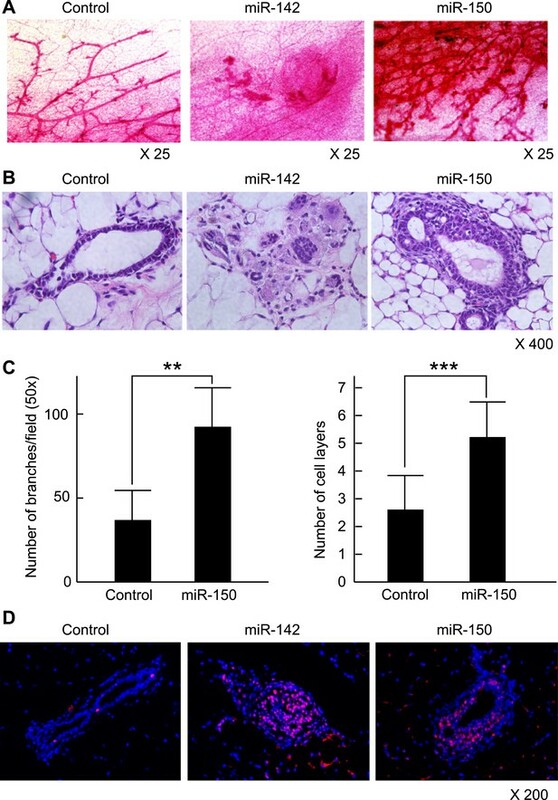 In vivo evidence is mandated to demonstrate that miR-142-induced dysplasia and miR-150-induced hyperplasia is relevant to actual breast cancer and not merely a correlation of expression level seems reasonable and critical to the paper. Reviewer 3 also touches on this issue, pointing out that the paper is about breast cancer stem cells, and since the effects on tumorigenicity are implied throughout the paper, it is important to demonstrate conversely that the miR-142 inhibited breast cancer cells display reduced tumorigenic capacity. Reviewers 2 and 4 echo the lack of rigorous testing of your in vitro data in vivo (for instance the efficacy and miRNA dosage of your shRNA-based strategy to knock down miR-142 and transfected miRNA precursors to overexpress miR-142), and point out the need to address whether WNT signaling is altered in the presence of miR-142 in vivo. In addition, the reviewers raise a number of specific points that need to be shored up if this work were to be published in eLife. Many of them deal with seemingly missing controls and/or simple experiments to more rigorously challenge the in vitro model. Although reviewer 2's suggested rescue experiment and the need to repeat the Ago experiments in a more appropriate cell type could be excluded if the authors are able to address the above 3 key points, the other specific points seem within the authors' grasp of what could be carried out in a reasonable length of time. At this point we request a written response that outlines how you could handle the requested revisions within a reasonable period of time. Our concern is how long it may take to perform the essential in vivo validation of the conclusions based on the in vitro experiments. The Board member will evaluate your responses and come to a decision concerning the appropriateness of your work for eLife. This manuscript investigates the functional role of two up-regulated miRNAs, miR-142 and miR-150, in breast cancer development. The authors propose an interesting idea, namely that miR-142 promotes breast cancer by directly targeting APC and thus activating Wnt-mediated miR-150 transactivation. Despite the attractiveness of their model, the authors do not support their major conclusions with sufficient evidence. The discrepancy between in vitro and in vivo observations further raises the doubt on the physiological relevance of miR-142/miR-150 function and underlying Wnt signaling, and this would need to be resolved prior to moving forward. Indeed in this reviewer's assessment, the main concern is the disparity of in vivo and in vitro effects from miR-142 or miR-150 overexpression. During mammary gland regeneration in vivo, miR-142 and miR-150 have opposite effects: one inhibits regeneration while the other promotes it even though in both cases, beta-catenin is stabilized and activated. How do the authors reconcile this in vivo observation with the proposed mechanism derived from their in vitro study that both sit in the same pathway with miR-142 activating Wnt and miR-150 suppressing APC? It would seem important to provide in vivo evidence to demonstrate that miR-142-induced dysplasia and miR-150-induced hyperplasia is relevant to actual breast cancer; as it stands this is merely a correlation of expression level. There are a few additional issues that seem important to address. It was not clear from the study how miR-142 and miR150 levels in cancer cells (BCSC or NTG) compare to levels in normal mammary tissue. Are these microRNAs up-regulated in tumor versus normal mammary tissue? The current data are not sufficient to conclude that the miR-142/APC/Wnt/miR-150 pathway is specifically required by the tumor-propagating cancer cells; it could just be a mechanism to bulk tumor growth. Finally, what is the percentage of human breast cancers with APC suppression that are not due to somatic mutation, promoter methylation or LOH? This information would help to assess whether this miRNA-mediated APC inhibition is a relevant mechanism in human cancer. Figure 1: What is the efficiency of the miR150-dependent recruitment of specific mRNAs to the RISC complex? Does this correlate with the types of miRNA seed matches as miR-142 does? The authors should minimally show control data that the miR-150 Ago2IP was efficient. To substantiate that miR-150 does not target APC as suggested by AgoIP, the authors should use luciferase assays to confirm. Figure 2D and 2E: What is the relative miR-142 overexpression level by the pre-miR-142 treatment in MCF7 and MDA-MB-231 cells? How much knock down is achieved with miR-142-3p miRZIP? These are important measurements to show how much endogenous miR-142-3p was perturbed by the various tools the authors used. In their manuscript entitled “miR-142 regulates the tumorigenicity of human breast cancer stem cells through the canonical WNT signaling pathway”, Shimono, Clarke, and colleagues present an interesting set of experiments that implicate miR-142 as a microRNA that is over-expressed in prospectively isolated tumorigenic human breast cancer populations. They present evidence, through Ago immunoprecipitation studies that APC mRNA is enriched in RISC upon miR-142 transfection. They show that miR-142 modulation regulates APC expression. They also show that miR-142 over-expression regulates miR-150 expression, while miR-150 over-expression enhances canonical WNT signaling. Finally, they show that miR-142 inhibition reduces breast cancer organoid formation, while miR-142 and miR-150 over-expression alters mammary gland organization. 1) If the above pathway is the model presented, a simple experiment would be to knockdown miR-142 in breast cancer cells (which the authors have already done) or mammary epithelial cells and perform qPCR for APC and miR-150. Prediction would be APC upregulation and miR-150 down-regulation. Have the authors done this? 2) A second prediction would be that inhibiting WNT signaling in breast cancer cells or mammary epithelial cells would lead to reduced miR-150 expression. This should be tested. 3) One thing that I don't understand is that based on the above model, miR-142 over-expression or inhibition should phenocopy miR-150 over-expression or inhibition. However, this doesn't seem to be the case as Figure 6 reveals opposite effects for miR-142 and miR-150. How do the authors reconcile this? 4) Have the authors tried to rescue the miR-142 organoid phenotype by introducing the APC coding sequence and determining if the effect is reversed? 5) Since the paper is about breast cancer stem cells and effects on tumorigenicity are implied throughout the paper, it is important for the authors to demonstrate that the miR-142 inhibited breast cancer cells display reduced tumorigenic capacity. 6) The authors should include control experiments on proliferation and apoptosis experiments upon miR-142 or miR-150 over-expression. I presume that there shouldn't be an effect since the effect is on renewal? 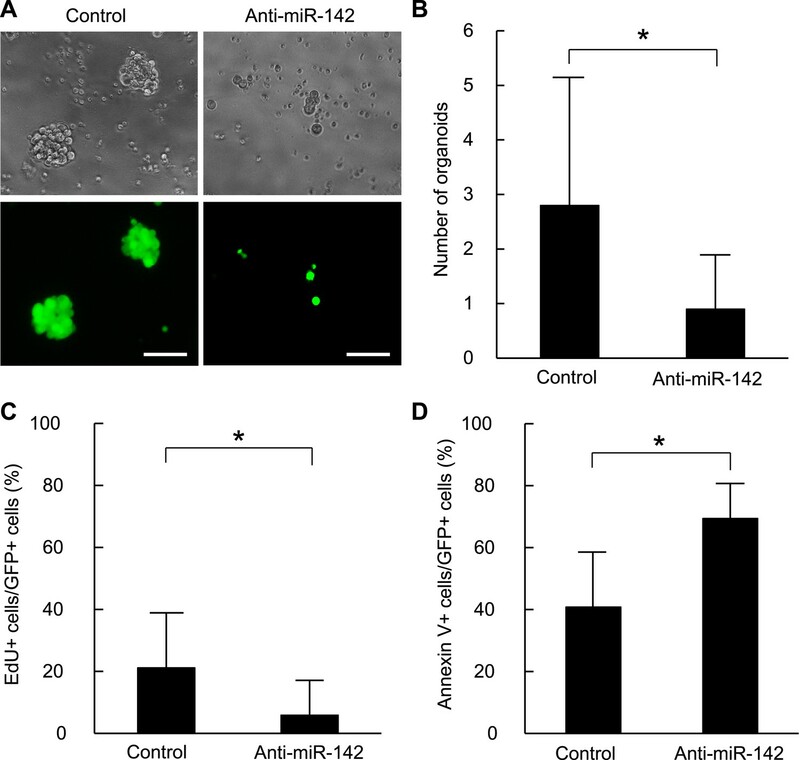 In the present work, Shimono and colleagues study the effect of miR-142 and miR-150 to Wnt signaling in vitro, how their deletion affects the spheroid formation ability of mammary cancer stem cells in culture, and how their overexpression influences mammary gland development in mammary reconstitution assays. They claim that miR-142 and miR-150 induce Wnt signaling and that this results to deregulation of breast cancer stem cells (BCSC) and overproliferation of normal mammary SC. The role of miR-142 in inhibiting APC expression in HEK293T cells have been previously reported by Liu et al, Biochemical and Biophysical Research Communications 408 (2011) 259-264 and other groups cited by the authors. Thus, the novelty of this study stems from the discovery that this regulation of miR-142 on WNT signaling is also relevant in the mammary gland. The topic of this study is interesting. However, there are 2 major weaknesses of the paper that needs to be addressed; firstly, the in vitro data presented was not subsequently tested rigorously in vivo, namely to address the question of whether WNT signaling is altered in the presence of miR-142. Secondly, while the central thesis of the authors pertains to the enhancement of tumorigenicity of BCSCs by miR-142, there is no demonstration that the breast cells overexpressing miR142 eventually develop tumours or are more prone to getting tumours compared to wildtype cells. Overall, the claims of the paper were not well substantiated by the data presented. The authors should revise their conclusions to more clearly reflect the findings of the study. However, the manuscript does provide interesting insights into the roles and mechanisms of miRNAs in the mammary gland that is generally not well described in the literature. Thus the paper in its current state doesn't fit the quality and novelty requirements and we recommend that the manuscript should potentially be revised and reconsidered for publication in the future if the authors can satisfactory address the different comments raised. 1) In Figure 2E, the authors use sh-RNAs against miR-142 in HEK293T and MDA-MB-231 cells, and they observe downregulation of APC protein levels. As previously described and cited by the authors herein, the MDA-MB-231 and HEK293T cells express low levels of miR-142. How anti-miR-142 can affect the APC levels in these cell lines if they don't express this miRNA? The authors should use another cell line, expressing miR-142 at a significant level, in order to prove that it is indeed the specific activity of sh-miR-142 that is responsible for the downregulation of APC. Showing the levels of miR-142 before and after the use of shRNA is also essential. 2) With reference to Figure 2, there is a lack of mechanistic insight into how miR-142 inhibits organoid formation in BCSCs. While the authors have demonstrated that miR-142 stimulates canonical WNT signaling via the inhibition of APC in HEK293T, MCF7 and MDA-MB231 cell lines, the role of miR-142 in the regulation of WNT signaling in the CSC population of MMTV-Wnt1 tumours was not formally tested. What is the level of the APC protein and TOP/FOPflash readout in sh-miR-142 infected cells? 3) In Figure 4 the authors present the effect of anti-miR-142 to spheroid formation to BCSC from mouse and human mammary tumours. The authors miss a control here, which is same culture setting with the addition of a Wnt inhibitor (ShRNA against b-catenin). 4) The authors state that their results suggest that miR-142 and miR-150 regulate Wnt signaling in BCSCs. However, the only relevant data in the present manuscript is the spheroid-forming assay using shRNA against miR-142, without estimating the Wnt pathway activity with or without the addition of shRNA and without testing the effect of overexpression or inactivation of miR-150 in BCSC. They should perform spheroid forming assays with overexpression/deletion of both miRNAs, compare and combine these assays with Wnt pathway inhibition, and finally perform in vivo tumour forming assays. 5) From the results presented in Figure 5, the authors conclude in the corresponding text that miR-142 upregulates miR-150 via the canonical Wnt signaling. To prove this point, the authors should use miR-142 expressing cells and show that the levels of miR-150 decrease upon addition of shRNA against β-catenin. 6) More importantly, the Figure 6 shows that when mammary epithelial cells are transfected with miR-150 and grafted in empty mammary fat pads, they recapitulate the phenotype of activated Wnt signaling (largely hyperplastic mammary gland). However, when transfected with miR-142, they observe the opposite phenotype (complete destruction of the mammary ducts), which clearly does not phenocopy the previously reported phenotypes of Wnt gain of function in the mammary gland. If miR-142 activates both Wnt signaling and miR-150 expression, then miR-142 transfection should give a comparable phenotype. These results therefore contradict the model derived from the in vitro data, and indicate that maybe this is not the case in mammary epithelial SC. Could miR-142 be regulating another key player that may lead to the observed dysplasia? Can the phenotype in miR-142 transduced and grafted cells be rescued with the knockdown of miR-150? The authors should also test whether WNT signaling is changed in this context by crossing with WNT-signaling reporter mice (for example TOPGAL or bat-gal). 7) The experiments presented in Figure 6 should be repeated using the CSC population in MMTV-Wnt-1 tumours and human BCSCs in order to substantiate the claims of the authors made in the title of the manuscript. 8) The β-catenin staining presented in Figure 7 is not convincing. Immunofluorescence of β-catenin is known to give very high background and false positive results, and the assay of choice to reliably test the expression of nuclear b-catenin is immunohistochemistry with proper controls. In this manuscript, Shimono et al. characterized miR-142-3p's function in human breast cancer stem cells. The authors present evidence that when overexpressed in 293T cells miR-142 is capable of recruiting APC mRNA to the RISC. They further validated the direct regulation of APC by miR-142 by the luciferase reporter assays and protein measurement. Because APC negatively regulates the canonical WNT signaling, the authors demonstrated, by the reporter assays, that high expression of miR-142 stimulates the WNT pathway. In cultured cells, knocking down miR-142 significantly reduced the organoid formation capacity of BCSCs. Conversely, overexpression of miR-142 causes mammary dysplasia in a transplantation assay. Overall, this study provides an interesting link for the elevated miR-142 (and miR-150 to a lesser extent) expression observed in BCSCs to the activation of the canonical WNT signaling. However, several issues existing in this manuscript have dampened my enthusiasm to this work. 1) The regulation by microRNAs is highly sensitive to cellular context. It was not clear why the authors performed their elegant Ago/IP experiments in HEK293T cells with transfected miR-142. In this experiment, both mRNA context and the expression of miR-142 were artificial (Figure 1). The result would yield little insights for how miR-142 would function in BCSCs. Although the authors subsequently validated the targeting of APC by miR-142 in MCF7, MDA-MB-231 cells, these cells also don't present BCSCs as identified by the authors (Figure 2). Thus, it remains a major task to confirm that APC is indeed regulated by miR-142 in BCSCs and determine the level of regulation in this context. In addition, it is now widely accepted that an miRNA can target hundreds of mRNAs. It is unclear to me why APC stands out as a target of particular importance, other than its well-documented role in the WNT signaling. It is not sufficiently explored whether the regulation of APC is a major or minor function of miR-142. As such, it remains an open possibility that miR-142 regulates other genes also involved in the WNT activation or other completely different pathways. Without these studies, it remains unclear whether miR-142 indeed functions through its control of the WNT signaling. 2) The authors used an shRNA-based strategy to knock down miR-142 and transfected miR precursors to overexpress miR-142. The function of miRNAs is highly sensitive to its dosage (Mukherji S et al., 2011). Thus, it is critical to document the efficacy and miRNA dosage with such experimental manipulations. One could argue that the overexpression experiment introduces a very high level of miR-142 and generates artifacts due to the high levels. The authors, at minimum, should compare the levels of overexpressed miR-142 to the elevated miR-142 observed in BCSCs. On the other hand, the authors should also document the knock down efficiency by the means of Northern blotting, qPCR or reporter assays esp. for a knock-down method that is not very well documented. 3) In Figure 3, the authors performed an interesting experiment to overexpress APC with WT and the mutated miR-142 target site in the presence of miR-142. However, the 3'UTR used was not the full length but a fragment. It is demonstrated that the position of miRNA target sites could affect the strength of regulation (Grimson A et al., 2007). Thus, by using a shortened 3'UTR, the authors could potentially alter the 3'UTR context of the miR-142 target site that, in turn, leads to artifacts. They should use the full-length 3'UTRs in all assays. 4) In Figure 4, the authors performed a series of experiments to document to the role of miR-142 in mouse and human BCSCs. However, the characterization is superficial and limited to simple organoid formation assay. Is it caused by reduced proliferation and/or enhanced cell death and/or cell senescence? Is the repressed WNT signaling by miR-142 knock down responsible for such defects or other pathways were also involved? More careful analysis is warranted for this study. 5) In Figure 6, the authors carried out mammary gland regeneration assay to probe the functions of miR-142/150. However, it is not explained whether miR-142/150 are up-regulated in normal mammary gland or during mammary gland regeneration or during tumor initiation of breast cancer. 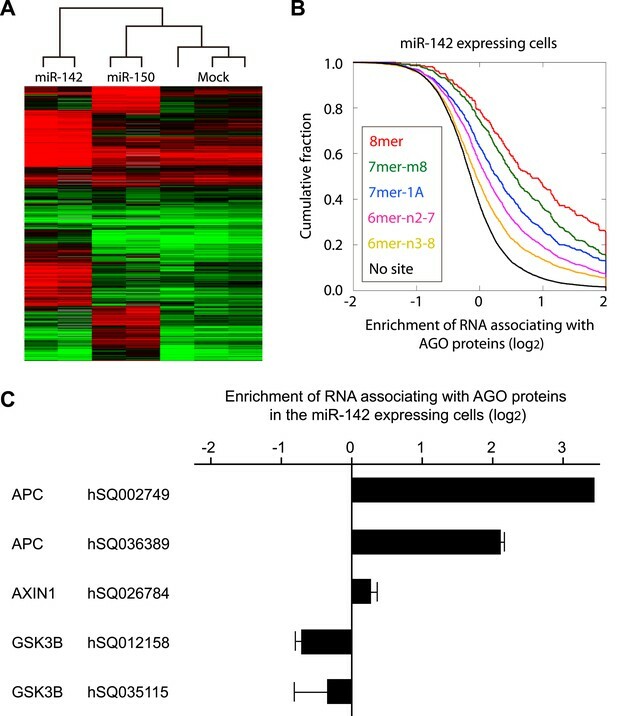 Without such information, the defective mammary gland regeneration caused by overexpression of miR-142/150 provides little insights for the roles of these miRNAs in BCSCs. Thank you for sending an outline of the proposed revision to the work entitled “miR-142 regulates the tumorigenicity of human breast cancer stem cells through the canonical WNT signaling pathway”. For the most part, the experiments you plan to conduct to address point 1 are reasonable and acceptable. 1) The reviewers asked the authors to understand the discrepancy between the in vivo and in vitro data. Based on the model, miR-142 over-expression or inhibition should phenocopy miR-150 over-expression or inhibition. However, this doesn't seem to be the case as during mammary gland regeneration in vivo, miR-142 and miR-150 have opposite effects: one inhibits regeneration while the other promotes it even though in both cases, beta-catenin is stabilized and activated. It would be essential to reconcile this in vivo observation with the proposed mechanism derived from the in vitro study that both sit in the same pathway with miR-142 activating Wnt and miR-150 suppressing APC. The authors respond to this comment by saying that different micro-RNAs may regulate many different functions, which is probably true, but it does not help to understand their data and proposed mechanisms if they are not substantiated by their functional experiments in vivo. 2) The revised version will need a better explanation of how the authors reconcile the discordant phenotypes of miR-142 over-expression/inhibition with miR-150 over-expression/inhibition given that they are proposing these miRNAs are in a pathway. 3) It is well recognized that a single miRNA can target hundreds of targets, and miR-142 has been shown to target APC previously. The authors' central hypothesis is that miR-142's effect in breast cancer is mediated through the activation of the Wnt pathway that activates miR-150 as a result. This discrepancy should be experimentally addressed in the revised version. 1) The results of the inhibition of miR-142-3p in the human breast cancer xenograft cells and the Wnt signaling pathway inhibition in human breast cancer cells have confirmed that our finding that miR-142 targets APC, activates the Wnt signaling pathway and upregulates miR-150 is applicable to human breast cancers. 2) The results of the immunohistological experiments have confirmed that both the ‘dysplastic’ mammary tissues regenerated by the miR-142-expressing mammary cells and the ‘hyperproliferative’ mammary tissue regenerated by the miR-150-expressing mammary cells represent a hyperproliferation phenotype, the former being more severe and disorganized than the latter. These results further support our model that both miR-142 and miR-150 regulate proliferation. 3) The results of the in vivo transplantation experiments using human breast cancer stem cells (BCSCs) isolated from a human breast cancer xenograft demonstrate that the inhibition of miR-142 significantly suppressed the growth of the human breast cancer cells in vivo. In the revised manuscript, we show that the knockdown of miR-142 increases the protein level of APC and decreases the expression of miR-150 in the human breast cancer cells derived from the human breast cancer xenograft (Figure 5E and Figure 7B). As for the second point, our results show that the knockdown of β-catenin suppressed the upregulation of miR-150 in the miR-142 expressing breast cancer cells (Figure 5D), further suggesting that the enhancement of miR-150 expression by miR-142 is at least partially mediated by the canonical Wnt signaling. We note that our new results show that miR-142 upregulates the expression of miR-150 when miR-142 is highly expressed and/or the Wnt signaling pathway is strongly stimulated in mammary epithelial cells. Considering that miR-142 is highly expressed in human BCSCs, but weakly expressed or undetectable in the stem/progenitor population of the mammary epithelial cells, our result suggest that the upregulation of miR-142 and its enhancement of the miR-150 expression seem to be especially relevant in the breast tumor progression in vivo. These issues are discussed in the Discussion section. In response to your previous correspondence, we have immunostained the mammary tissues regenerated by the miR-142- and miR-150-expressing mammary cells using an anti-PCNA antibody as a maker for proliferation. Our results show that both the miR-142-expressing ‘dysplastic’ mammary tissue and the miR-150-expressing ‘hyperproliferative’ mammary tissues are highly stained with an anti-PCNA antibody (Figure 6D). In contrast, the cells in the control mammary glands are hardly stained with this antibody. These results show that the changes seen with the enforced expression of miR-142 are a type of hyperproliferation that is accompanied with abnormal morphology (dysplastic changes). These results suggest that the phenotypes of both the miR-142-expressing and miR-150-expressing mammary tissues are hyperproliferative and support that miR-142 and miR-150 are in a pathway. Because the word ‘dysplastic’ is a medical pathology term that the broad readership might not be familiar with, we paid careful attention and rewrote the results and discussion to describe our findings on the miR-142-expressing mammary tissues in the manuscript. To confirm that miR-142 is relevant to the actual breast cancer and BCSCs in vivo, we infected the human BCSCs isolated from the human breast cancer xenograft using a flow cytometer with the anti-miR-142-expressing or control lentivirus. Then we transplanted them into NSG mice. The growth of the tumors formed by the human BCSCs transfected with the anti-miR-142-expressing lentivirus was significantly slower than those of the control tumors formed by the control lentivirus transfected BCSCs (Figure 7A). We further confirmed that the protein level of APC was elevated in the human breast cancer xenograft formed by the human BCSCs transfected with the anti-miR-142-expressing lentivirus (Figure 7B), which is consistent with our observations using the breast cancer cell lines. The result of the quantitative real-time PCR showed that the expression levels of miR-142 in MCF7 and MDA-MB-231 cells transfected with miR-142-expressing lentivirus were elevated to the level which was comparable to that of human BCSCs isolated from the 11 surgically resected primary human breast cancer specimens (Ct values distribute between 23-30 when the Ct value for internal control gene small nucleolar RNA C/D box 96A was 20). Because miRZip sequence that binds to the endogenous microRNA and prevents it from functioning do not generally cause a degradation of the endogenous microRNA, we did not observed the change of the miR-142 level by qPCR in the miR-142-3p miRZIP (anti-miR-142-3p)-expressing cells we analyzed, except for the CommaD-beta cells and the human breast cancer xenograft cells in which the amount of miR-142 in the anti-miR-142-3p-expressing lentivirus infected cells was less than one third of the control cells. We further confirmed that the protein level of APC was elevated in the human breast cancer xenograft cells transfected with the anti-miR-142-3p-expressing lentivirus than those transfected with the control lentivirus in vivo (Figure 7B). In addition, we analyzed the transfection efficiency of the anti-miRNA lentivirus into the human BCSCs using a flow cytometer. We found that 94% and 96% of BCSCs were transfected with the control or anti-miR-142-expressing lentivirus, respectively, two days after the transfection. These results are consistent with our in vitro observations presented in the manuscripts and show that miR-142-induced dysplasia and miR-150-induced hyperplasia is relevant to actual human breast cancers. These data are presented in Figure 7 and described in the Results of the manuscript. There are a few additional issues that seem important to address. It was not clear from the study how miR-142 and miR150 levels in cancer cells (BCSC or NTG) compare to levels in normal mammary tissue. Are these microRNAs up-regulated in tumor versus normal mammary tissue? We previously analyzed the miRNA expression profiles of the cancer cells in the BCSC and NTG cell populations from the 11 surgically resected primary human breast cancer specimens, and the epithelial cells in the stem/progenitor cell and other epithelial cell populations of human normal breast tissue. The expression of miR-142 in the cancer cells in the BCSC population was on average about 24 times higher than those in the NTG cell population. In contrast, the expression of miR-142 was undetectable in the epithelial cells in the stem/progenitor cell and the other epithelial cell populations of human normal mammary tissues. The expression level of miR-150 in the cancer cells in the BCSCs population of the primary human breast cancers was about 23 times higher than that in the epithelial cells in the human normal mammary tissues. These results are in line with our finding that miR-142 enhances the expression of miR-150. The current data are not sufficient to conclude that the miR-142/APC/Wnt/miR-150 pathway is specifically required by the tumor-propagating cancer cells; it could just be a mechanism to bulk tumor growth. Our new data show that the knockdown of miR-142 by infecting the anti-miR-142-expressing lentivirus to the human BCSCs significantly suppressed the growth of human breast cancers in vivo (Figure 7A). In addition, the expression of APC protein was elevated in the breast cancer xenograft generated by the anti-miR-142-3p-expressing BCSCs (Figure 7B). Together with our findings that the organoid forming ability by human BCSCs was significantly suppressed and the expression of miR-150 was reduced when miR-142 was selectively knocked down in human BCSCs (Figure 4 and Figure 5E), our results suggest that the miR-142/APC/Wnt/miR-150 pathway is involved in the regulation of the human BCSCs. Because the expression levels of miR-142 and miR-150 are about 24 and 23 times lower in the non-tumorigenic cancer cells than in the tumorigenic BCSCs of human breast cancer, we speculate that the importance of the miR-142/APC/Wnt/miR-150 pathway in tumor propagation is much higher in the BCSCs than in the non-tumorigenic cancer cells. The most recent analyses of the TCGA sequencing project from ∼962 patients’ tumors show only a couple of mutations in β-catenin or GSK3B (which degrades it). However, about ∼2% of patients have a mutation or deletion of APC (the TCGA Research Network). Previous studies reported that there is a reduction or loss of expression of the APC protein in 40.7% of primary human breast cancers (Ho et al., 1999), and it appears to be more often due to promoter methylation (36-54%) and loss of heterozygosity (LOH) (23%) than to somatically acquired APC mutations in human breast cancers (Sarrio et al., 2003, Jin et al., 2001, Banerji et al., 2012, 2012). However, the APC mutations in breast cancers are much more frequently seen in advanced than early stage breast cancers (Furuuchi et al., 2000). Wnt signaling is a regulator of the development and maintenance of the mammary tissues and the initiation and growth of breast cancers. We and others showed that miR-142 enhances the Wnt signaling and our results show that expression of miR-142 is highly upregulated in BCSCs isolated from human breast cancers. These results suggest that the stimulation of the Wnt signaling pathway is critically important for some human breast cancers especially at the initial step of the breast cancer formation. Figure 1: What is the efficiency of the miR150-dependent recruitment of specific mRNAs to the RISC complex? Does this correlate with the types of miRNA seed matches as miR-142 does? The authors should minimally show control data that the miR-150 Ago2IP was efficient. The efficiency of the miR150-dependent recruitment of specific mRNAs to the RISC complex correlated with the types of miRNA seed matches as miR-142 does. The data are presented in Figure 1–figure supplement 1. To substantiate that miR-150 does not target APC as suggested by AgoIP, the authors should use luciferase assays to confirm. The results of the luciferase assays show that miR-150 suppressed the activity of the luciferase expression plasmid in which the potential target site within the APC mRNA was fused with a luciferase gene by 32%. However, in contrast to miR-142, APC mRNA was not efficiently enriched by miR150 in the Ago IP experiment (Figure 1–source data 1-4), and the activity of TOP Flash plasmid that contains the TCF binding site within its promoter was much weaker in the miR-150 transfected cells than in the miR-142 transfected cells. Because each miRNA has multiple target genes, we speculate that the presence of many other target genes with higher affinity to the miR-150 containing RISC will perturb the ability of miR-150 to regulate APC and miR-150 has much weaker effect, if any, on the Wnt signaling pathway in vivo. We touched this point in the Discussion. We responded these issues at the #3 of the Major points raised by the editors and the reviewers. 1) Ho KY, Kalle WH, Lo TH, Lam WY, Tang CM 1999 Reduced expression of APC and DCC gene protein in breast cancer. Histopathology 35: 249-256. 2) Sarrio D, Moreno-Bueno G, Hardisson D, Sanchez-Estevez C, Guo M, Herman JG, et al. 2003 Epigenetic and genetic alterations of APC and CDH1 genes in lobular breast cancer: relationships with abnormal E-cadherin and catenin expression and microsatellite instability. Int J Cancer 106: 208-215. 3) Jin Z, Tamura G, Tsuchiya T, Sakata K, Kashiwaba M, Osakabe M, et al. 2001 Adenomatous polyposis coli (APC) gene promoter hypermethylation in primary breast cancers. Br J Cancer 85: 69-73. 4) Banerji S, Cibulskis K, Rangel-Escareno C, Brown KK, Carter SL, Frederick AM, et al. 2012 Sequence analysis of mutations and translocations across breast cancer subtypes. Nature 486: 405-409. 5) Furuuchi K, Tada M, Yamada H, Kataoka A, Furuuchi N, Hamada J, et al. 2000 Somatic mutations of the APC gene in primary breast cancers. Am J Pathol 156: 1997-2005. We appreciate the reviewer for these important comments. We responded these issues at the #1 of the Major points raised by the editors and the reviewers. We appreciate the reviewer for these important comments. We responded these issues at the #2 of the Major points raised by the editors and the reviewers. We used the organoid culture system that is able to recapitulate the function of stem/progenitor cells and their differentiation of the primary cells derived from normal or cancer tissues. However, it is practically difficult to perform the rescue experiments in the organoid culture system because the lentivirus transfection is required for the gene transduction into the primary stem/progenitor cells and the APC gene (> 8.5k base pairs) is too large to be cloned into the lentivirus. We appreciate the reviewer for these important comments. We responded these issues at the #3 of the Major points raised by the editors and the reviewers. Our new data show that cell proliferation of the mammary tissues regenerated by the miR-142-expressing and miR-150-expressing mammary cells was enhanced compared to those regenerated by the control mammary cells (Figure 6D). The cell proliferation was suppressed and apoptosis was enhanced in the anti-miR-142 transfected human breast cancer xenograft cells (Figure 4 C and D). The regulation of cell proliferation and the suppression of apoptosis are a part of the self-renewal abilities that characterizes stem cells. We have previously shown that BMI1, a Polycomb group gene that has critical roles in the self-renewal of various stem cells, regulates proliferation and apoptosis by regulating the expression of the p16Ink4a and p19Arf gene locus (Park, et al., 2003, Nature, 423, 302-305). In this manuscript, we presented that miR-142 targeted APC, activated the Wnt signaling pathway, and induced the miR-150 expression. Because Wnt signaling is involved in the regulation of proliferation and apoptosis, and miR-150 is reported to regulate proliferation of breast cancer cells, we think that the functions of these microRNAs include the regulation of cell proliferation and apoptosis. The transduction of the genes into the primary cells requires the lentivirus and the transduction is much less efficient. Although we could not perform TOP/FOPflash experiments in the MMTV-Wnt1 tumors using the lentivirus with the TOP/FOPflash constructs, we evaluated the effect of anti-miR-142-3p using the human breast cancer xenograft cells. The result of the real-time PCR analyses show that the amount of miR-142 in the anti-miR-142-3p transfected cells was less than one third of the control cells. We further confirmed that the protein level of APC was elevated in the human breast cancer xenograft cells transfected with the anti-miR-142-3p lentivirus (Figure 7B). These results suggest that anti-miR-142-3p is efficiently working and miR-142 targets APC in the primary breast cancer cells. The requested experiment is impossible to perform because the primary normal and many cancerous mammary cells fail to form organoids in the absence of Wnt agonists. In this manuscript, we focused the role of miR-142, one of the miRNAs upregulated in human BCSCs, and found that miR-142 targets APC, up-regulates the Wnt signaling, and induced the expression of miR-150 that has an ability to induce hyperproliferation of mammary tissues. Thus, we think that the roles of miR-150 in the organoid forming activities are interesting, but not critical for understanding our results. We evaluated the effect of anti-miR-142-3p using the human breast cancer xenograft cells and confirmed that the protein level of APC was elevated in the human breast cancer xenograft cells transfected with the anti-miR-142-3p-expressing lentivirus (Figure 7B). Finally, we performed the in vivo tumor forming assays using the anti-miR-142-3p-expressing human BCSCs and the results are presented at the response to the major points raised by the editors and the reviewers #3. We confirmed that the protein level of APC was elevated and the expression of miR-150 was decreased in the human breast cancer xenograft cells transfected with the anti-miR-142-3p lentivirus (Figure 5E and Figure 7B). And the transfection of the siRNA against β–catenin resulted in the reduction of miR-150 expression in the miR-142-3p-expressing human breast cancer cells (Figure 5D). In the original manuscript, we were not clear that both miR-142 and miR-150 cause a hyperproliferation defect. In the revised manuscript, we provide additional evidence that clearly shows that increased expression of both miR-142 and miR-150 induce proliferation. We are sorry that we did not make this point clearer in the original manuscript. In the revised manuscript, we present the result as Figure 6–figure supplement 1. As the reviewer pointed out, the immunohistochemistry of β-catenin in general suffers from nonspecific staining. However, in the experiments presented in Figure 6–figure supplement 1, we detected the strong positive signal in the dysplastic mammary tissue regenerated by the miR-142-expressing mammary cells. In contrast, it is difficult to detect the β-catenin signals in the mammary tissue regenerated by the mammary cells transfected with the control lentivirus. We speculate that nuclear β-catenin was detectable in the immunohistochemistry experiments presented in Figure 6–figure supplement 1 because the Wnt signaling pathway was highly overstimulated in the miR-142-expressing mammary cells. We described these issues in the Result section. We completely agree that there are likely other important miR-142 targets. However, our data clearly suggests that the β-catenin pathway is an important target for miR-142. We agree the reviewer that position of the target site affected the strength of the regulation. However, the APC mRNA with the full length 3’UTR (>10k base pairs) was too long to be evaluated in the transfection assays. We hope that our new data using the anti-miR-142-expressing cells further support the roles of miR-142 on the regulation of the APC protein expression. We analyzed the proliferation and apoptosis of the organoid formation by human BCSCs. We found that the cell proliferation was suppressed and apoptosis was enhanced in the anti-miR-142 transfected human breast cancer xenograft cells (Figure 4C and D). Our new data show that the knockdown of miR-142 in the human breast cancer xenograft cells resulted in the increase of the protein level of APC and decrease of the miR-150 expression (Figure 5E and Figure 7B). In addition, the transfection of the siRNA against β-catenin resulted in the reduction of miR-150 expression in the miR-142-expressing human breast cancer cells (Figure 5D). And we confirmed that the growth of the tumors formed by the human BCSCs transfected with the anti-miR-142-expressing lentivirus was significantly slower than those of the control tumors formed by the control lentivirus transfected BCSCs (Major points raised by the editors and the reviewers #3) These data suggest that the regulation of APC and the Wnt signaling is at least one of the important pathways targeted by miR-142 in human breast cancer cells and BCSCs. We analyzed the miRNA expression profiles of the cancer cells within the BCSCs and NTG cell populations from the 11 surgically resected primary human breast cancer specimens, and the epithelial cell within the stem/progenitor cell and other epithelial cell populations of human normal breast tissue. The expression of miR-142 was significantly upregulated in the cancer cells within the BCSC population, which was about 24 times higher than those in NTG cancer cells. In contrast, the expression of miR-142 was undetectable in the epithelial cells within the stem/progenitor cell and the other epithelial cell population of human normal mammary tissues. The expression of miR-150 was observed in human normal mammary tissues. The expression level was about 23 times upregulated in the cancer cells within the BCSC population of the primary human breast cancers. These results support our hypothesis that miR-142 which is significantly unregulated in human BCSCs enhances the expression of miR-150 in human breast cancer cells. 1) First, we will treat MDA-MB-231 and/or MCF7 breast cancer cells with either LiCl or Wnt3A in order to activate the Wnt signaling pathway. Expression of miR-150 will be measured using qPCR. 2) Next, the breast cancer cells will be transduced with an shRNA targeting β-catenin and expression of miR-150 will be measured. 3) Finally, the breast cancer cells will be transduced with an siRNA or shRNA targeting miR-142 or a control siRNA/shRNA, with or without stimulating the cells with LiCl or Wnt3A in order to activate the Wnt signaling pathway, and qPCR for APC and miR-150 will be done to measure their expression. These experiments should address the referees’ concerns. We are sorry that we failed to convey our results regarding the effects of enforced expression of miR-142 and miR-150 on normal mammary gland biology more clearly. Our current model is that miR-142 enhance the Wnt signaling pathway by reducing the APC protein level, and induce the transcription of miR-150 as one of the Wnt target genes. Both miR-142 and miR-150 cause aberrant proliferation of the mammary cells in vivo. However, dysplastic changes were seen in miR-142 expressing cells while enforced expression of miR-150 only resulted in hyperproliferative changes. As reviewer 2 pointed out, these results are consistent with previous observations using a breast cancer cell line that miR-150 has the ability to promote cell proliferation. It is not surprising that miR-150 overexpression does not fully recapitulate the effects of miR-142 expression. The Blelloch group has previously shown that microRNAs regulate multiple targets each of which partially contributes to the cellular processes controlled by the microRNA (Subramanyam D, Lamouille S, Judson RL, Liu JY, Bucay N, Derynck R, Blelloch R. Multiple targets of miR-302 and miR-372 promote reprogramming of human fibroblasts to induced pluripotent stem cells. Nat Biotechnol. 2011 May; 29(5):443-8.). We agree that this data would substantially strengthen the manuscript. We have performed the first batch of the experiments in which miR-142 was knocked down using a sh-miR-142-expressing lentivirus in the breast cancer stem cells derived from the human breast cancer xenograft. These cells were transplanted into immunodeficient mice. The results show that the shRNA knockdown of miR-142 prolongs the time to initial engraftment and inhibits the tumor growth of human breast cancers generated by the transplantation of human breast cancer stem cells. Thus the result is promising, but we need to repeat them to be sure that the results are correct. Because induction of the genes or shRNAs into the breast cancer stem cells are possible by using the lentivirus and the growth of the human breast cancer cells in the mouse xenograft models takes up to three months, we think that it will take three to four months to replicate this experiment. KL: This author is a principal scientist of the Applied Biosystems. MFC: Michael Clarke holds stock of the Oncomed Pharmaceuticals that focuses on development of therapeutic methods to target cancer stem cells. This work was supported by the California Breast Cancer Research Program of the University of California #12FB-0053, and the Grants-in-Aid from the Japan Society for the Promotion of Science to YS, by the Fundacion Alfonso Martin Escudero and the Fulbright to MZ, by the Research Fellowship of the Japan Society for the Promotion of Science for Young Scientists to SH, by the Research Grant of the Research Foundation for Community Medicine, Japan, to TI, by the grants from the NIH (NIH CA100225, CA104987, CA126524, CA139490), the U.S. Department of Defense (W81XWH-11-1-0287, W81XWH-13-1-0281), the Breast Cancer Research Foundation, and the Ludwig Foundation to MFC, and by the NIH S10 Shared Instrumentation Grant #1S10RR02933801. The funders had no role in study design, data collection and analysis, decision to publish, or preparation of the manuscript. Human subjects: Primary breast cancer specimens and/or normal breast tissue were obtained from patients with informed consent in compliance to Protocol 4344, pre-approved by Stanford Institutional Review Board (IRB). Specifically, IRB Protocol 4344 authorizes acquisition of human breast tissue from the patients recruited in Stanford University Hospital and Clinics and City of Hope National Medical Center (COH), Los Angeles, then documented and delivered by Stanford Tissue Bank. Protocol 4344 waives the researchers in this study of patient consent requirement because (1) all patients recruited are pre-consented by physicians or surgeons in the Stanford Hospital and Clinics or in the COH under their IRB approval; (2) the researchers of this study do not have any direct contact with the recruited patients, (3) the researchers of this study do not receive any protected health information (PHI) of recruited patients; (4) all specimens received by the researches of this study are de-identified and labeled only as a sequential number, without any clinical association. Animal experimentation: All animal experiments were carried out in compliance to Protocol 10868, pre-approved by Stanford University Administrative Panel on Laboratory Animal Care (APLAC). All researchers, who performed procedures using live animal, were pre-approved by Stanford APLAC, based on their completion of required animal use and care training, and acceptable previous experience in animal experiments. © 2014, Isobe et al.